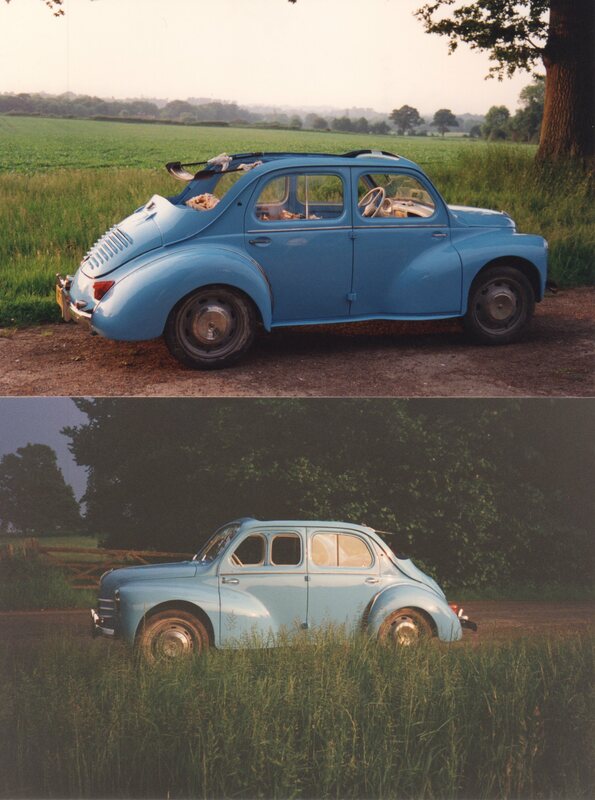 Regie wasn’t the families first classic, the human’s first car, when she was at college, was an A35 but we’ll keep that for another post. 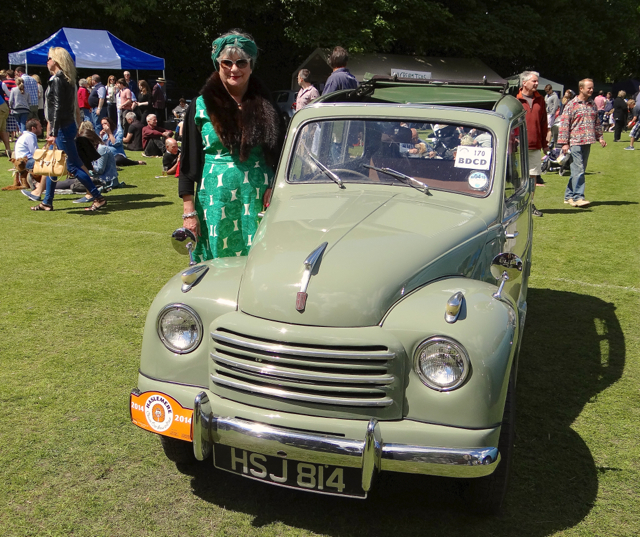 However with the A35 off the road a visit to a car show had introduced us to a Renault 4cv – the french equivalent of the A30/A35, Morris Minor etc and a love affair was born. 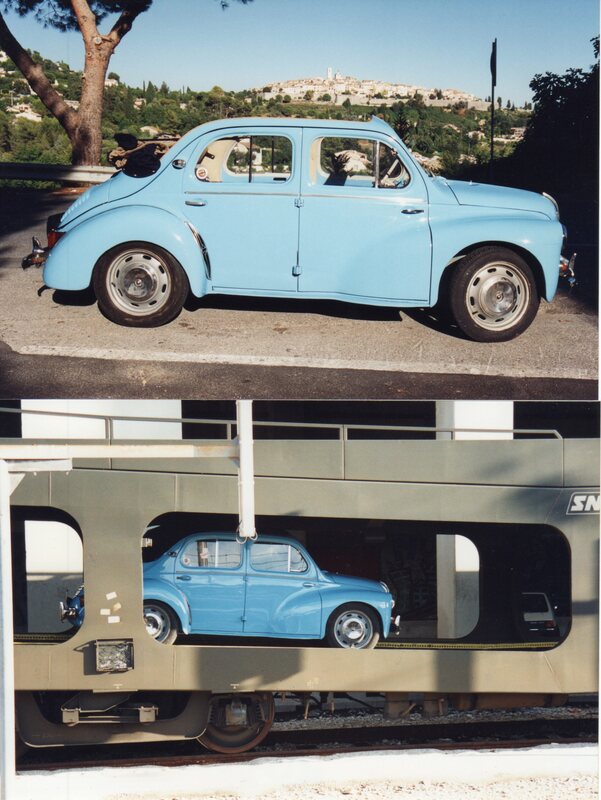 Now 4cv’s or 750’s as they were known in the UK were pretty few and far between over here so while on holiday in the South of France in 1993 we went to look at one for sale in the village near our friends house, where we were staying. It was OK but the owner wanted too much money so we left it. 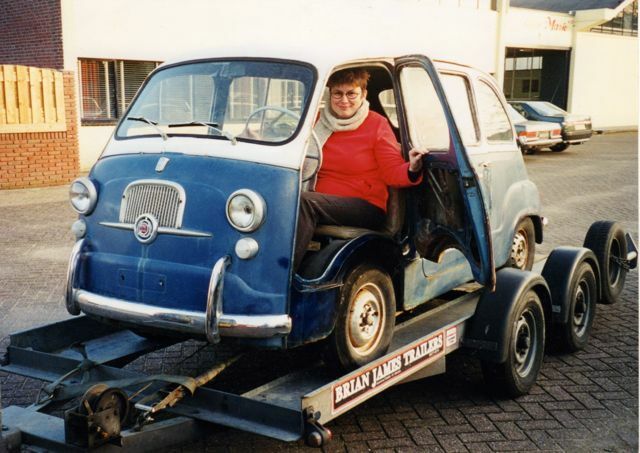 A few months later, just before Christmas our friends phoned and said they had found us a convertible model for sale, did we want it? 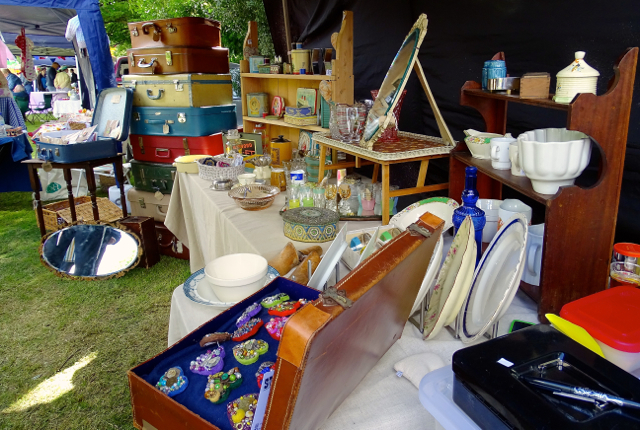 So without knowing anything about it we said yes and sent a jiffy bag, with if I remember rightly about 8000 francs, in the post. 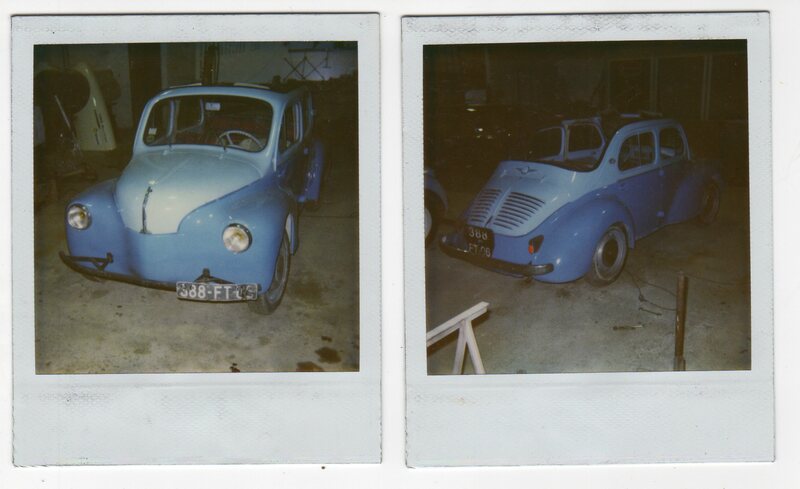 We received back in the post these polaroid pics. 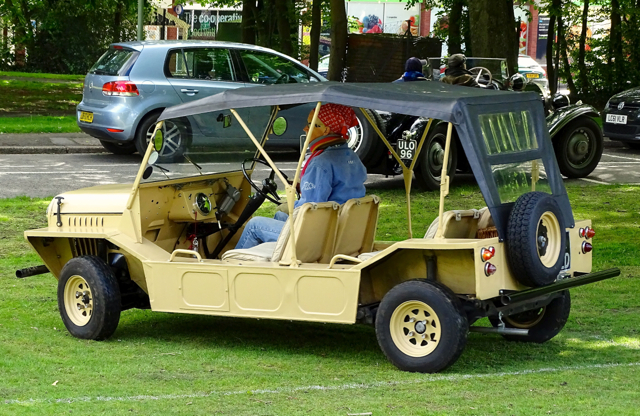 The car apparently ran but had been used by the wife of the local Citroen dealer as a beach car and as such had no roof at all! 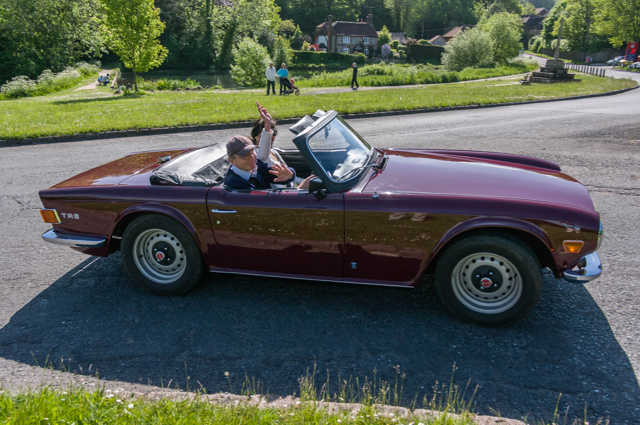 When we started researching the convertible – not as easy in those pre-google times – we discovered that the convertible or Découvrable as it was known in France was very rare, the factory only made 9518 convertibles compared to over a million salons. 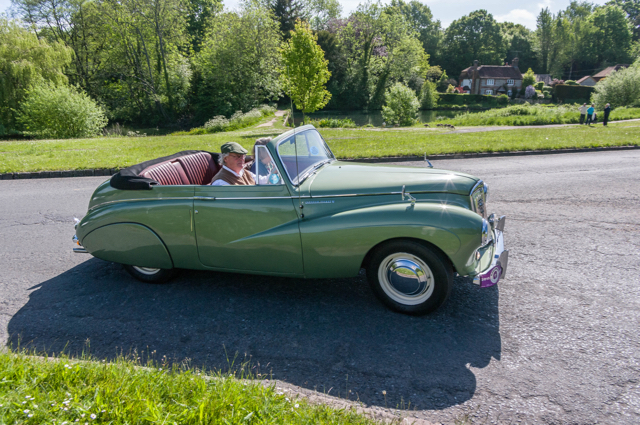 As Regie was built in Sept 1958 and factory convertibles were only made up until 1956 we believe that our car is an ex-factory conversion, done when the car was new, an option which was available at the time. 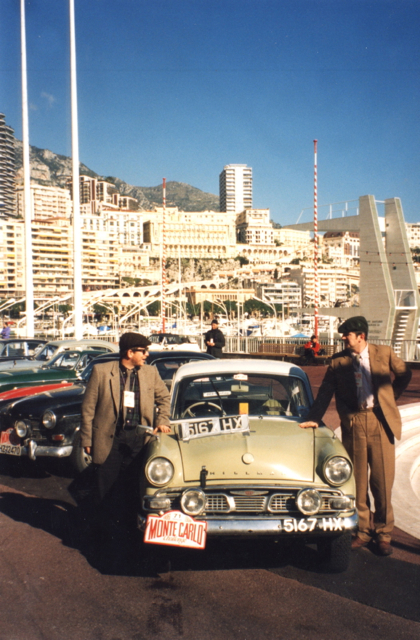 So in February 1994 we set off for the South of France with a borrowed estate car and trailer to collect the 4cv. 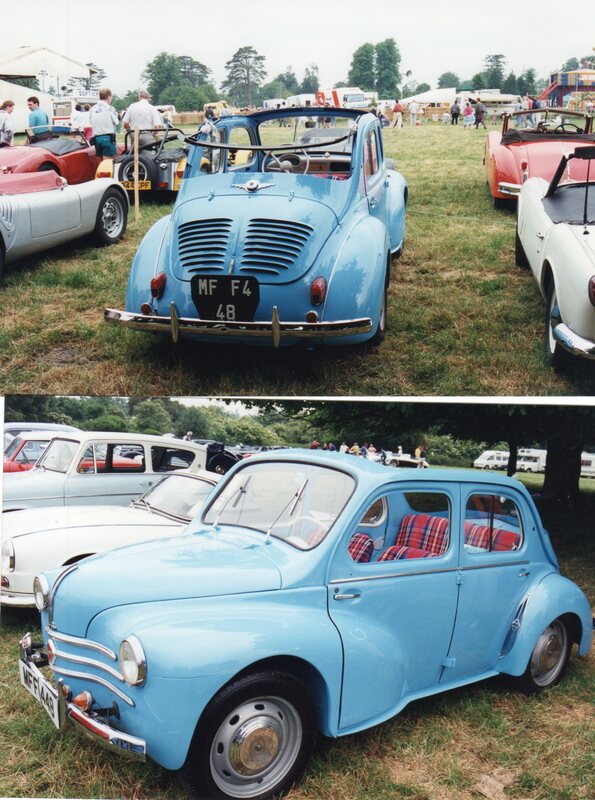 We took along the now rather sad A35 to give to another friend of ours who had always wanted one, they are as rare in France as the 4cv is here. 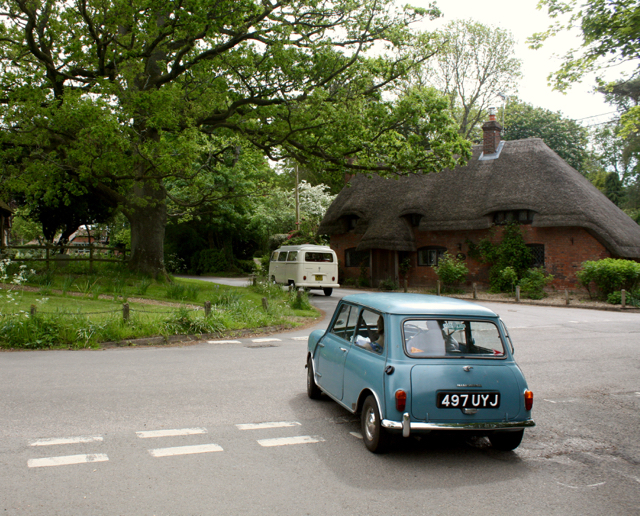 When we first saw the 4cv at our friends house we were very pleased that it was running and had fun driving it around the grounds and even popped down to the village for some fuel. 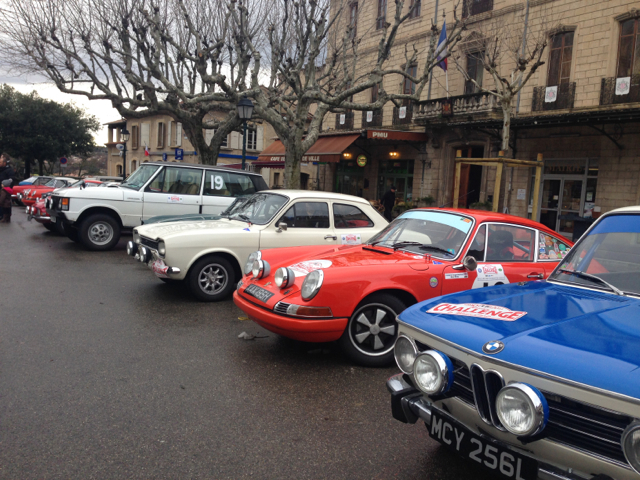 It was very cold for the South of France and there was snow in the hills and mountains when we went to watch the Monte Carlo Classic Rally come through, no need to say that we didn’t travel in a roofless 4cv! We took the opportunity to use our friends pit to have a good look underneath and were pleased to find it was pretty solid. 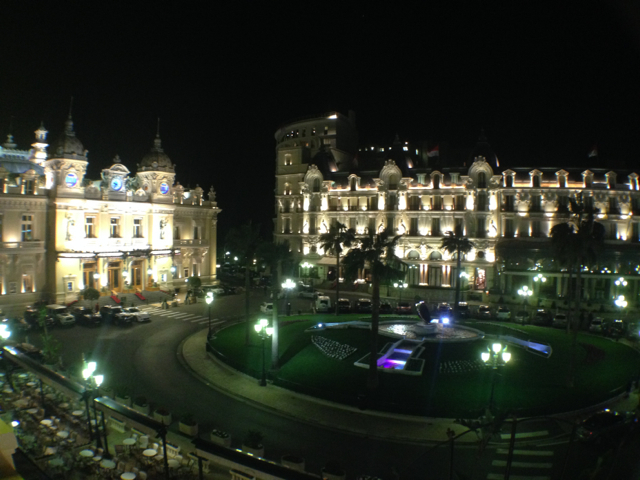 The Cotes d’Azure climate had been kind to it. 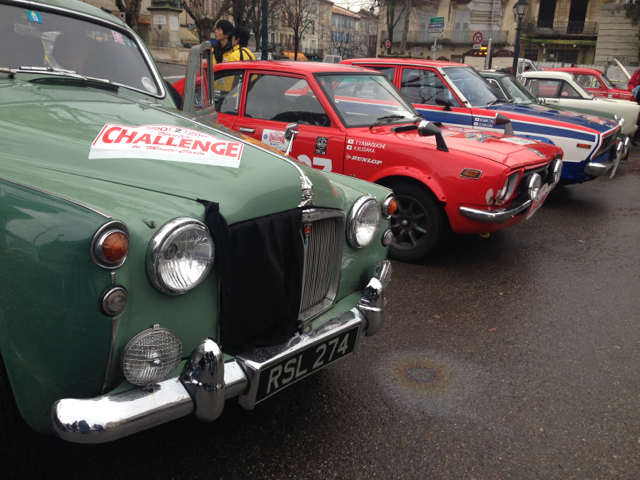 We stopped off in Paris on the way back to go to the Retromobile show and pick up some bits and pieces for the restoration. 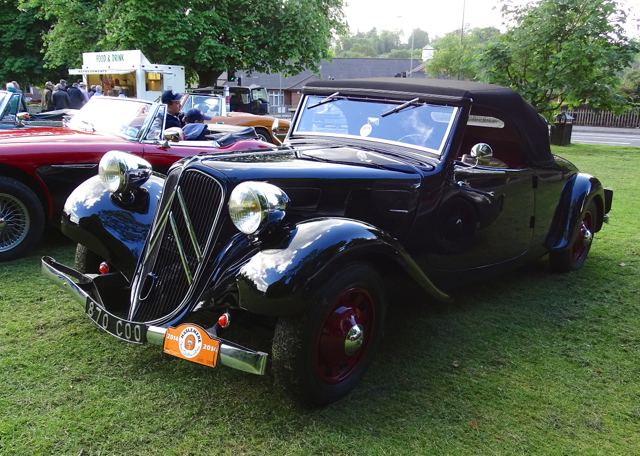 We purchased a new badge for the front – the Renault diamond shape but in the 50’s the company was ‘Regie National Union Renault’ or RNUR which appears on the badge and has confused lots of people ever since! It is also of course where the name ‘Regie’ came from. 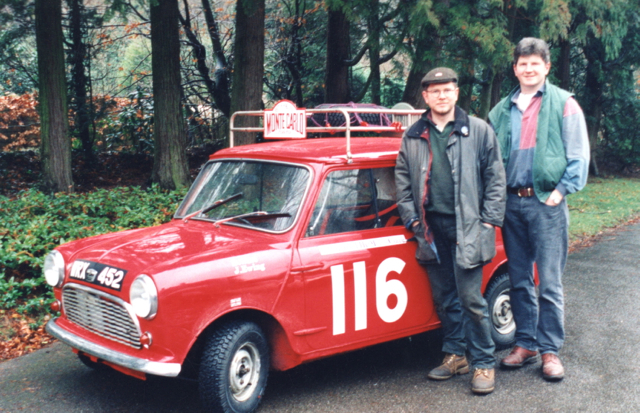 Once home we cracked on with the plans for Regie, this was ten years before James started his restoration business and so this was going to be a ‘hobby’ project. 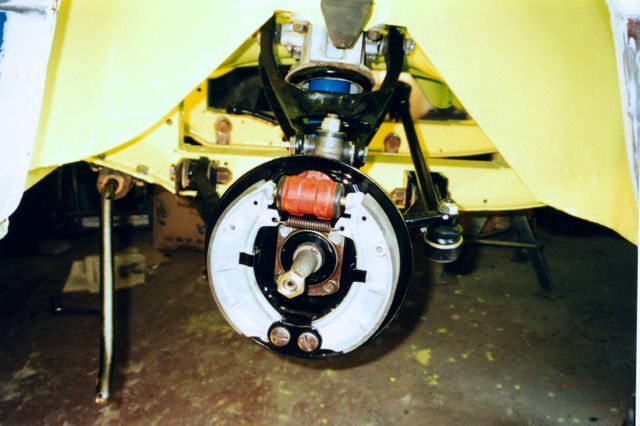 Initial work included the re-bushing of the suspension and completely overhauling the brakes. 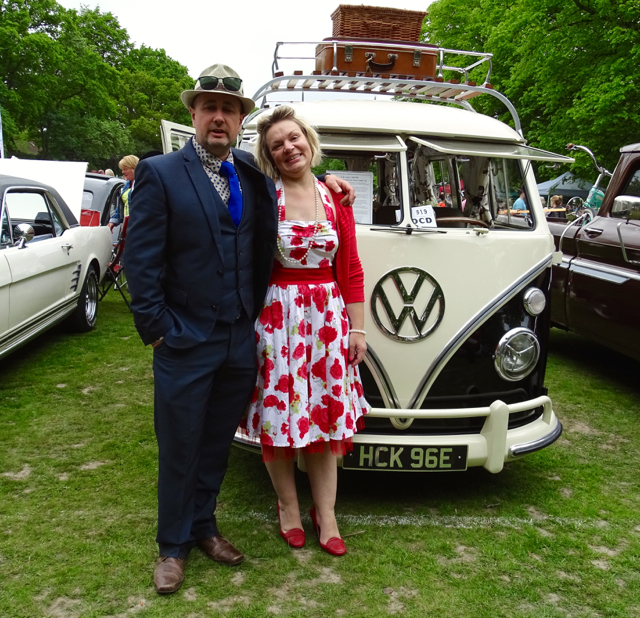 On my birthday on 23rd March, James surprised me by picking me up from the train in Regie, he’d secretly got an MoT and attracted lots of looks driving into the Station to collect me. 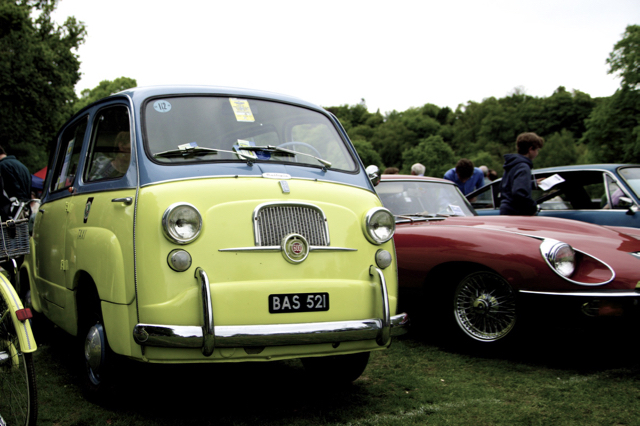 By April we’d managed to sort all the paperwork and the car was registered in the UK… MFF 448 was born. 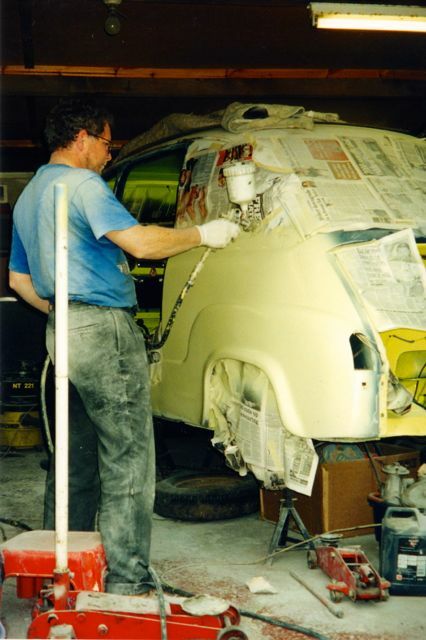 As James was working out of a small lock-up at home and he had no facilities in those days for body/paintwork, we set off on our first adventure driving round the M25 to Stevenage to our friend Mike’s who had a paint shop. 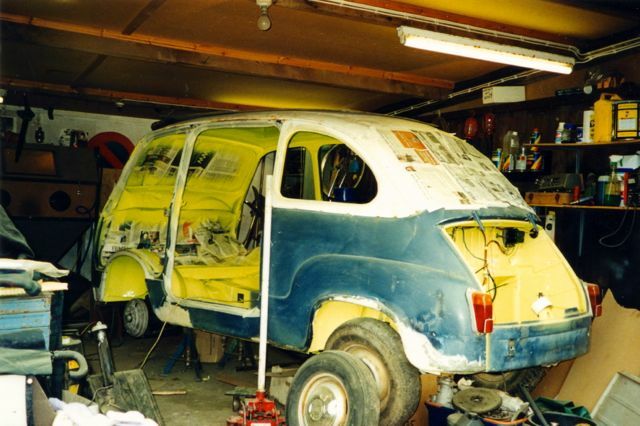 To save money we spent a weekend striping everything off the car, removing all the glass etc ready for Mike to start on the bodywork. 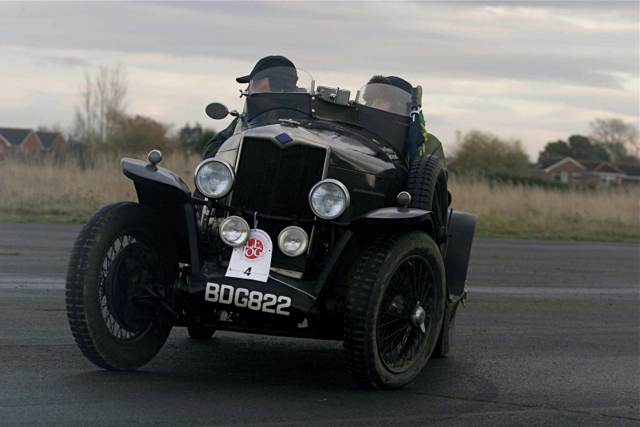 Mike soon discovered why the bonnet didn’t fit too well – the front was about 2 inches shorter than it should have been, having obviously had a front end impact at some time which had been bodged rather than repaired properly. 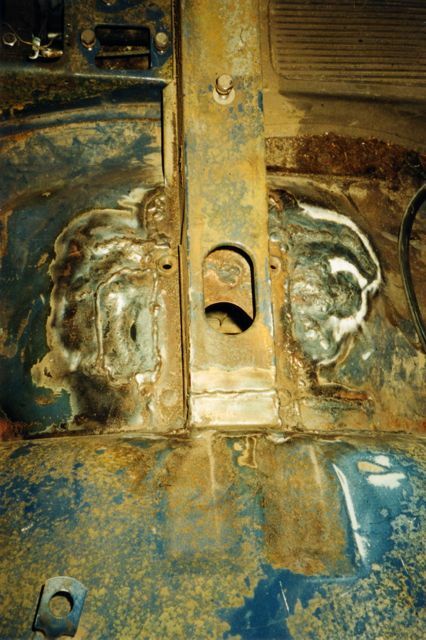 Mike, a real expert, soon put that right, fabricated and fitted new foot wells and repaired other minor damage. 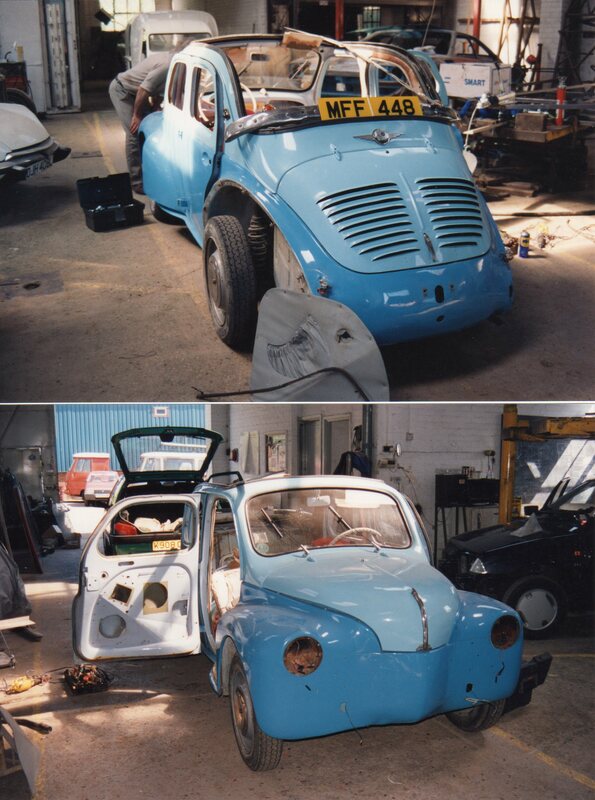 Our initial idea for the colour had been French Racing or Gordini Blue, that lovely sort of mid toned colour, however Mike had other ideas and when we went back to Stevenage to put the car back together we were confronted by something much brighter! 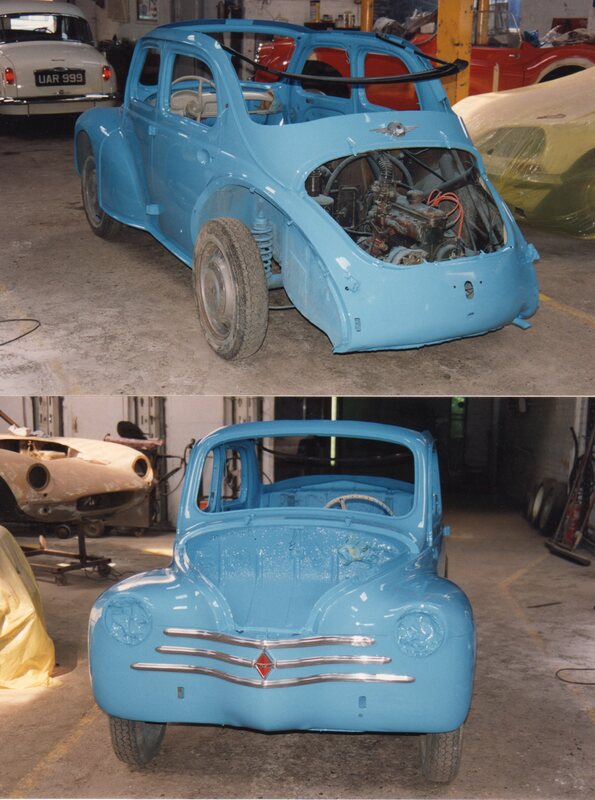 Mike had thought that the original choice was too dark and so mixed by eye some ‘Bugatti blue’ and sprayed the car. 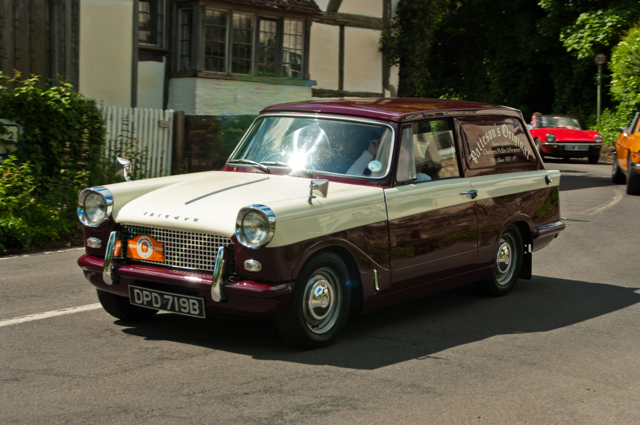 Once we’d got over the initial shock, put our sunglasses on and put all the brightwork back on the car we knew he was right and the colour was and still is to this day just perfect for Regie. 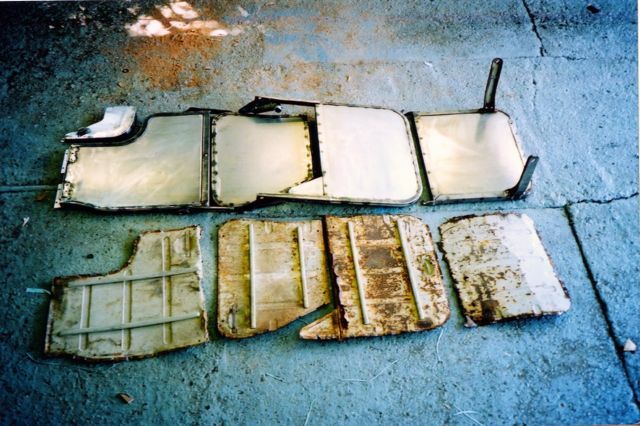 The car had been missing it’s distinctive ‘Moustache’ bars from the front (6 on early cars, 3 on later) but we’d been able to retrieve some from a car that was used for filming ‘Good Morning Vietnam’. 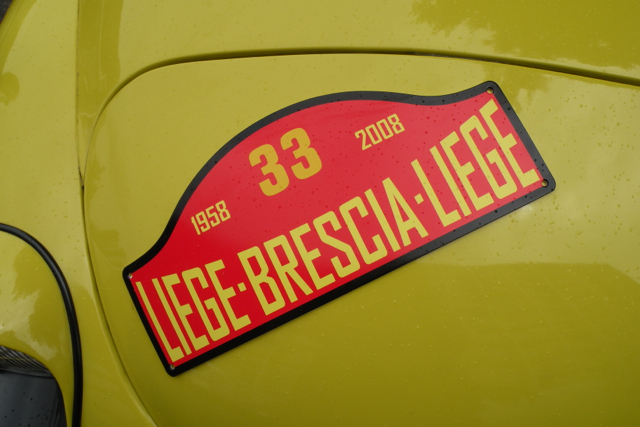 The original ‘old stock’ RNUR badge we had picked up from Neo Retro at Retromobile completed the look. The chrome wing piping was also a nice finishing touch. 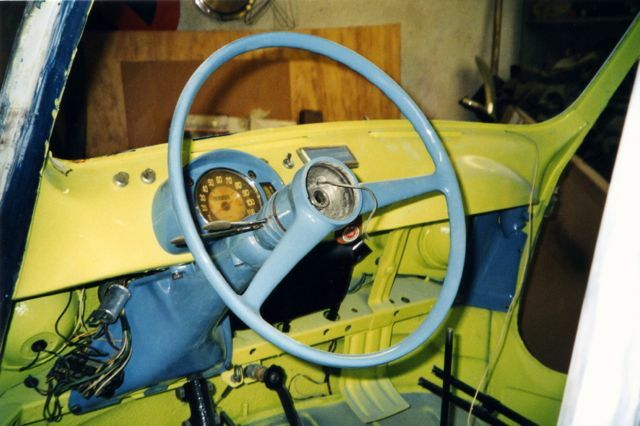 The dashboard, inner window frames and steering wheel were sprayed back to their original contrast colour. 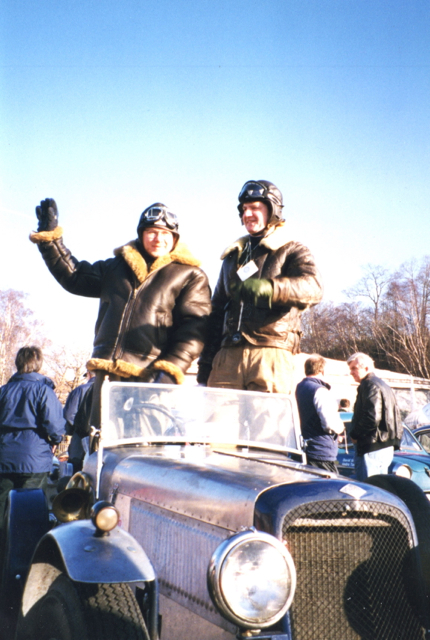 James and Mike had constructed the missing roof frame from some publicity pictures but they turned out to be from a pre-production car so a mark2 version had to be constructed later. 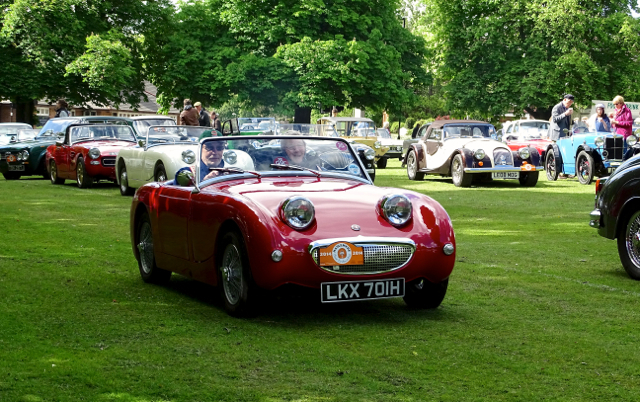 We took Regie home in his ‘half finished state’ and took a couple of weeks out to drive him around and have fun, this was perfect as long as the weather stayed fine as we still had no hood. 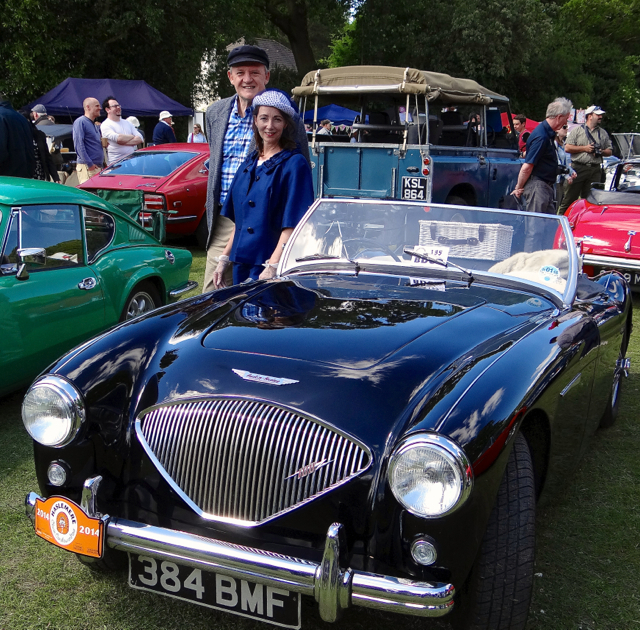 June 19th 1994 was our first big outing, James was away at Le Mans but I had a ticket for the enthusiasts car park at the 94 Goodwood Revival, this was inside the park on what is now part of the display area and I was determined that Regie would be on show. 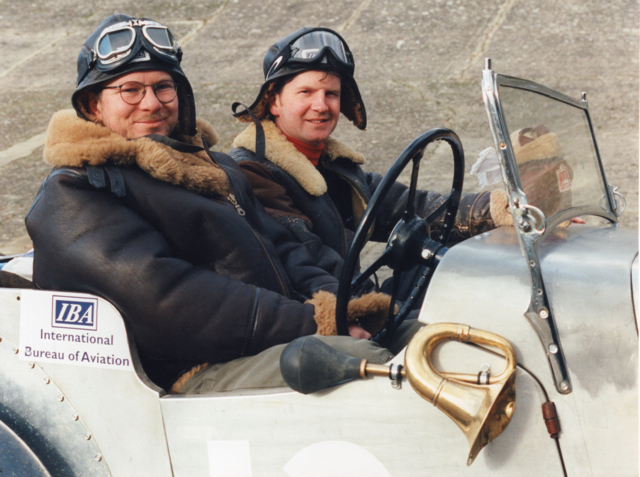 We still had no roof and the seats were held together with gaffer tape and then wrapped in tartan blankets but the bodywork looked cool and so with my parents and a picnic on board we set off for Goodwood. 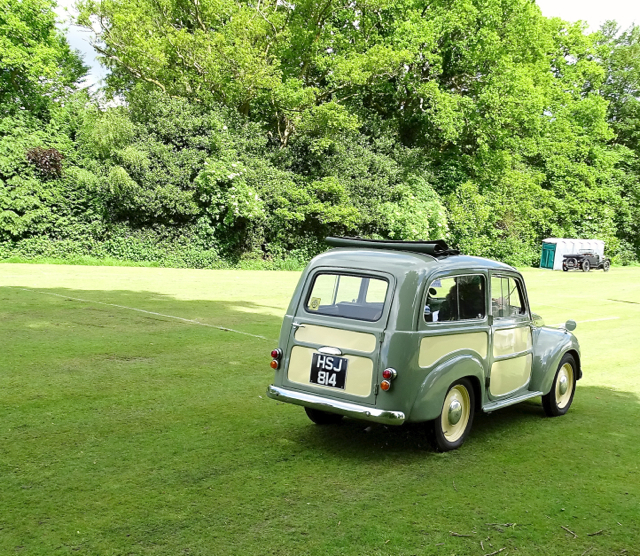 My Dad was convinced that the tiny engine wouldn’t make it up Goodwood Hill but it did, just! 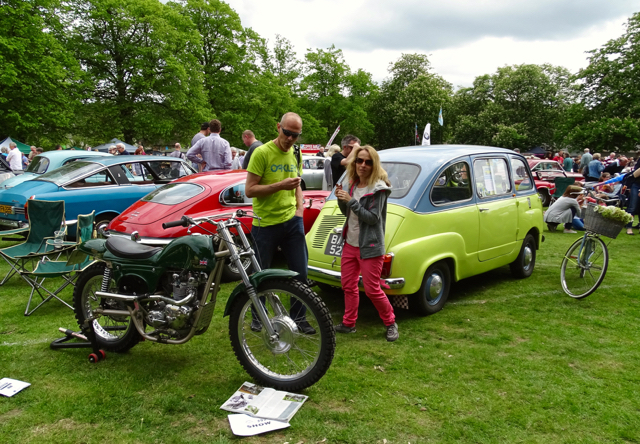 The car attracted a lot of attention even in it’s half finished condition. 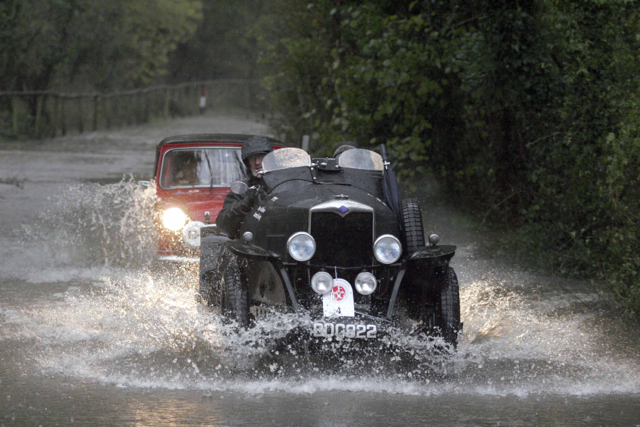 The most important thing was to make the car waterproof. 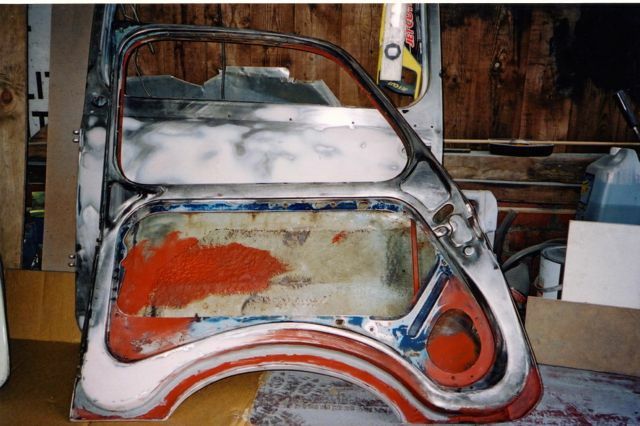 The mark2 frame was correct and our Trimmer Jeff did a brilliant job working out the right lines for the hood. 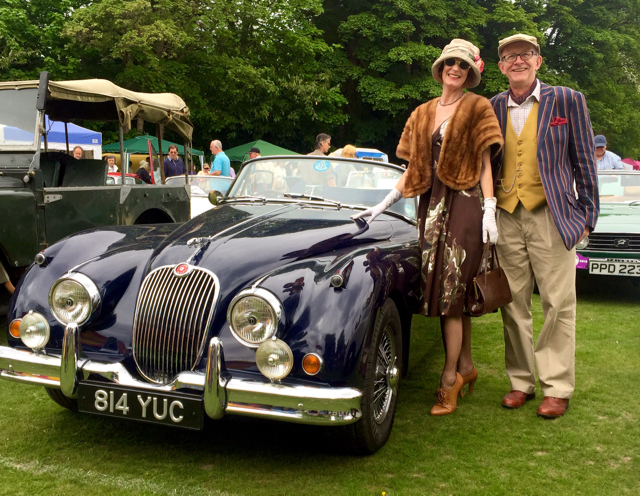 We had the hood made in some lovely BMW material which is dark blue on the outside but beige on the inside so the car interior didn’t seem too dark, this was possible thanks to a small inheritance I had received from my Grandfather, he was always very enthusiastic about old cars and taught me to drive, he would have loved to have seen the Renault but unfortunately died just before we got it so it seemed a very fitting thing to do to remember him by. 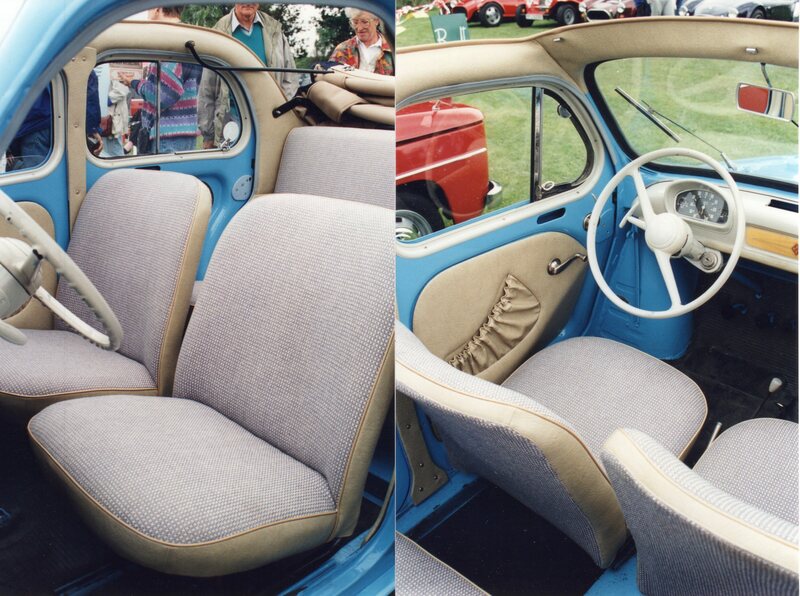 The trimmer also rebuilt the seats and covered them with some lovely authentic cloth and trimmed all the inside, door panels etc. 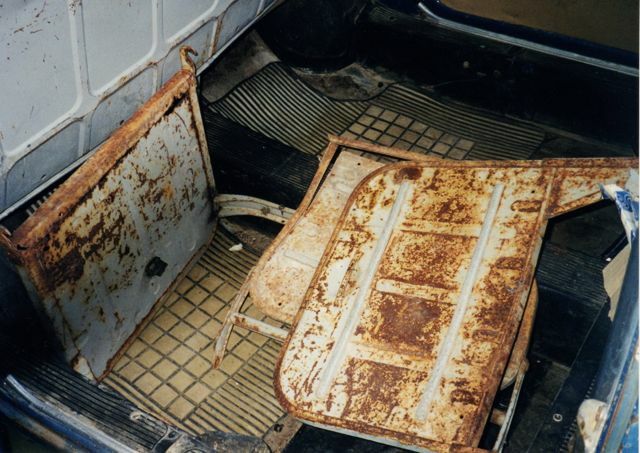 The french cars only ever had rubber mats on the floor, so luckily we were able to get a repro set from France at great expense but they fitted perfectly. 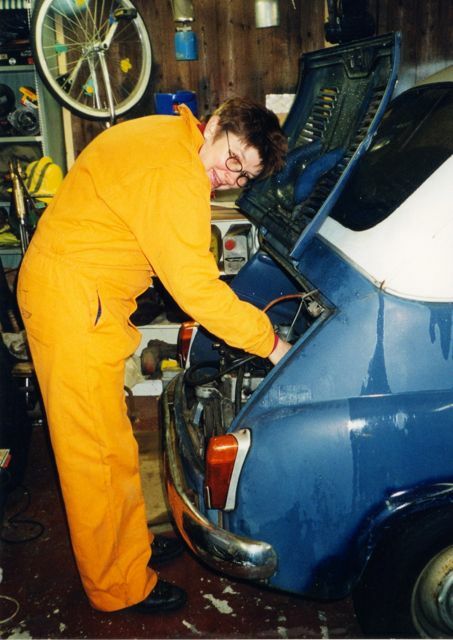 Now the car was protected from the elements, the last thing was to sort the engine. 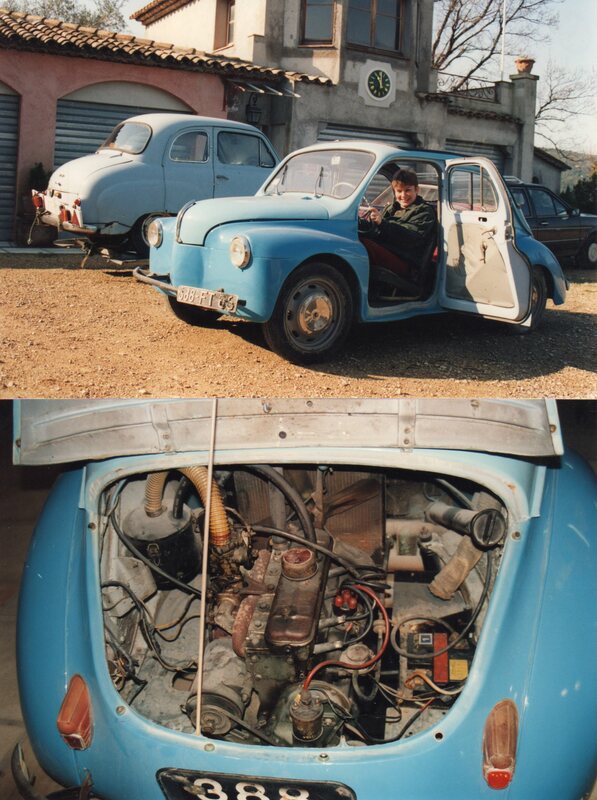 Originally a 750cc, 3 speed it was rather low on horsepower and we had been given an 850cc Dauphine Gordini engine and four speed box by our french friend in return for the A35. 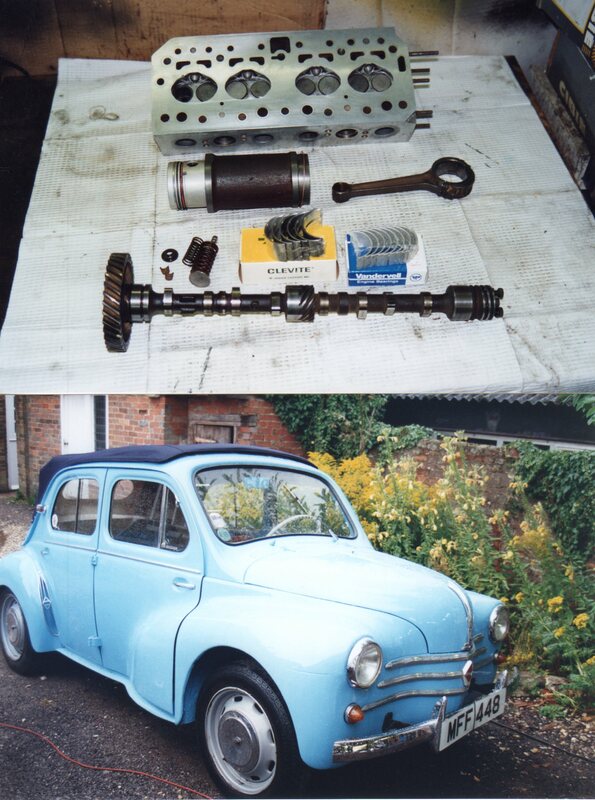 James picked it up when he went to Le Mans and we were pleased to find it was pretty complete and so James rebuilt the Gordini head, inserted new pistons and liners and replaced the bearings. 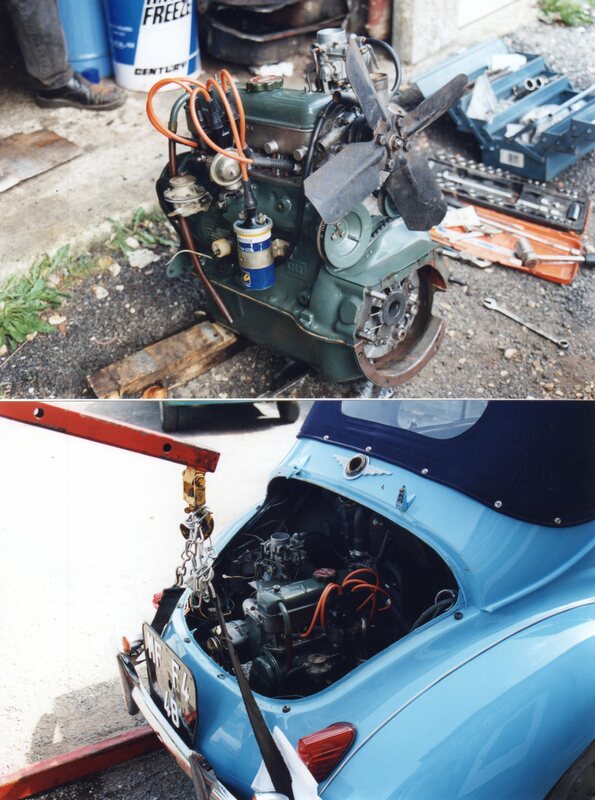 Then one weekend in August, with the help of yours truly and a crane we changed the engine in the car park at home. 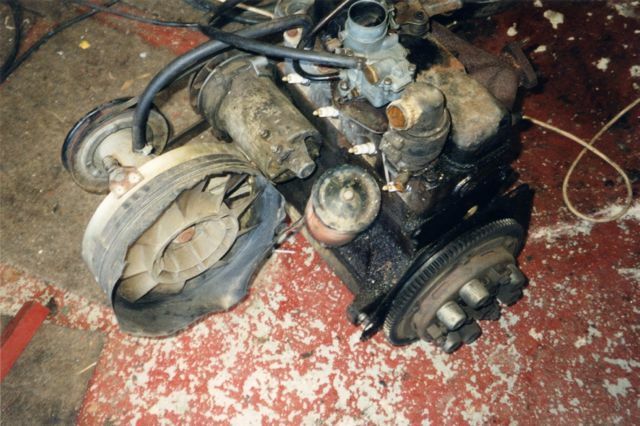 The old engine was out in under two hours, the whole thing comes out on the axle, you just lift the car body up over it and pull the wheels and engine out! 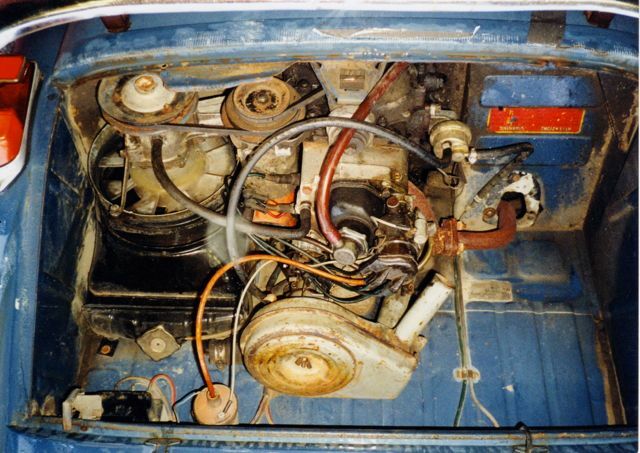 The new engine went in as easily and it started first time! 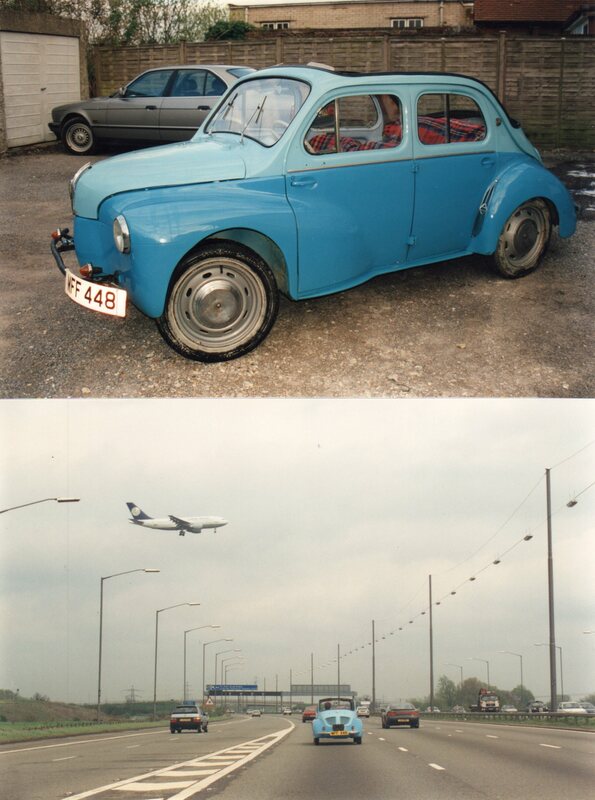 On the 7th September 1994, 7 months after collecting Regie he was back on French Soil. 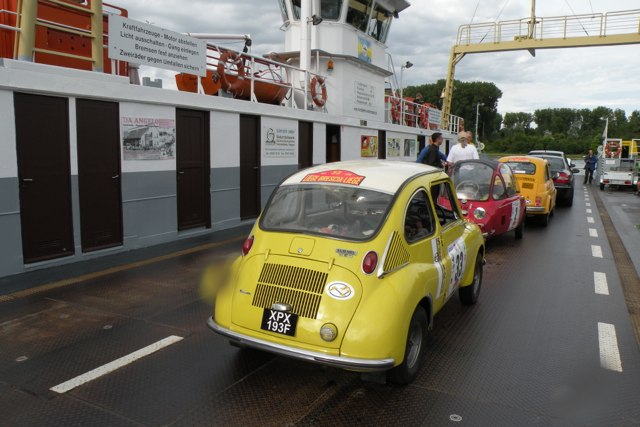 After an overnight ferry to Le Harve, breakfast in Honfleur and then an easy journey to Paris to get the MotorRail down to Fréjus in the South of France for the short drive to our friends in Grasse. 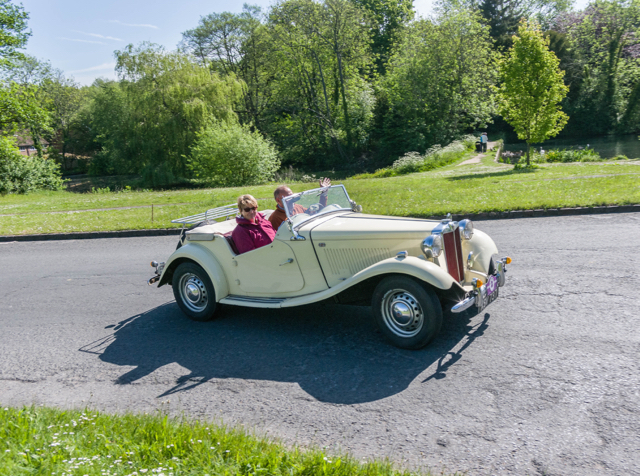 We had a great time, Regie is the perfect car for cruising the Cotes d’Azure, we met up with many car orientated french friends and some english ones who loved a trip out in the glorious sunshine. 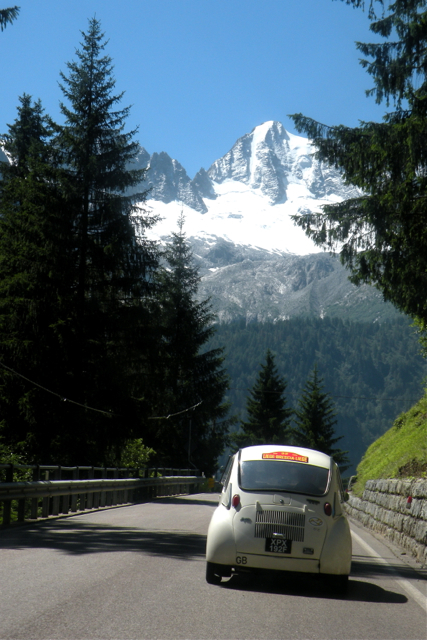 In the 20 years we have had Regie we have been to Europe on many occasions, taking him to France, Germany, Italy, Spain, over the Alps and the Pyrenees, to the Monza Grand Prix twice and to some fabulous car shows. 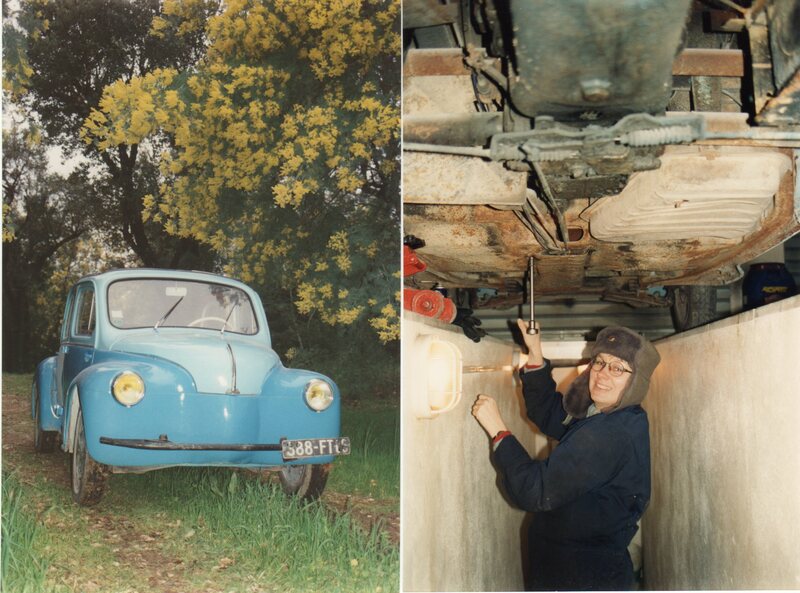 We have had ups and downs, broken 2 crankshafts and been recovered home, had overheating problems, a broken windscreen and had the engine out in a square in a small village and then had a blacksmith weld bits up. 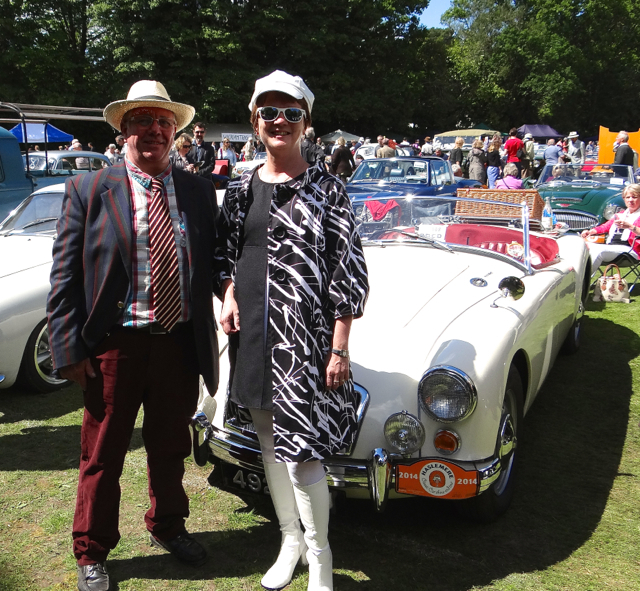 But it’s all been tremendous fun and we have many very happy memories. 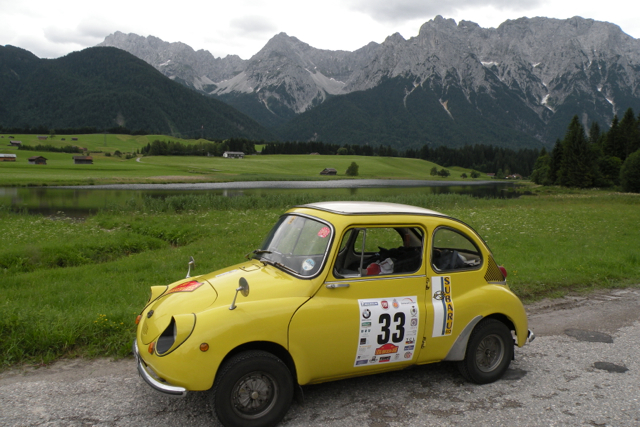 Over the years James has fettled and developed the car so it is reliable, with the Gordini engine it runs at a sensible speed and keeps up with modern traffic meaning it is safe and practical to take on long journeys across Europe. 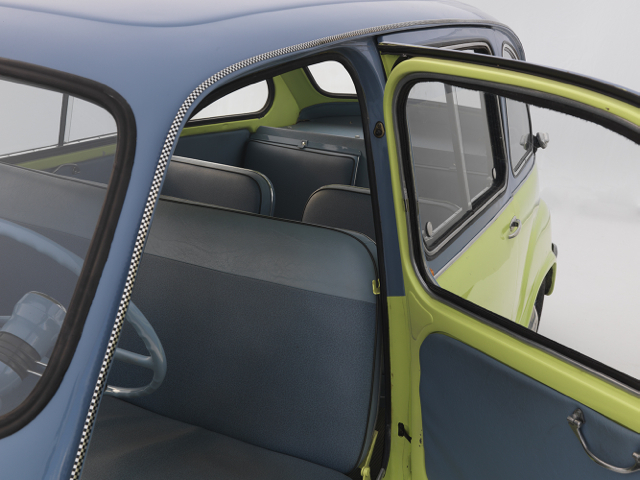 We have added a few bits of French ‘bling’ – chrome sills and shiny Robri end plates to the wings – in period there were hundreds of accessories available for the 4cv. 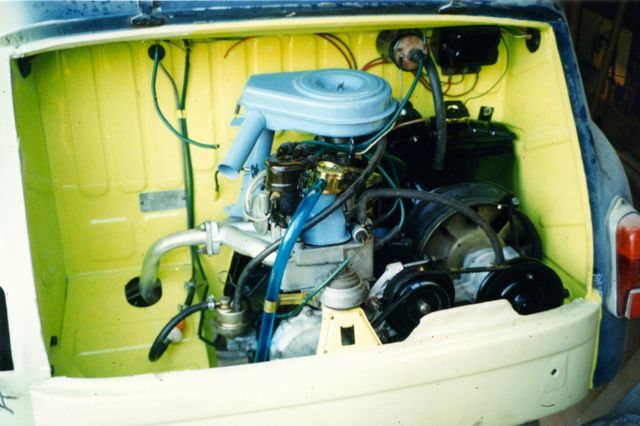 Other than the mentioned crankshafts and the cooling system we haven’t had to do much to the car, in fact many of the parts are the same as when it was restored. 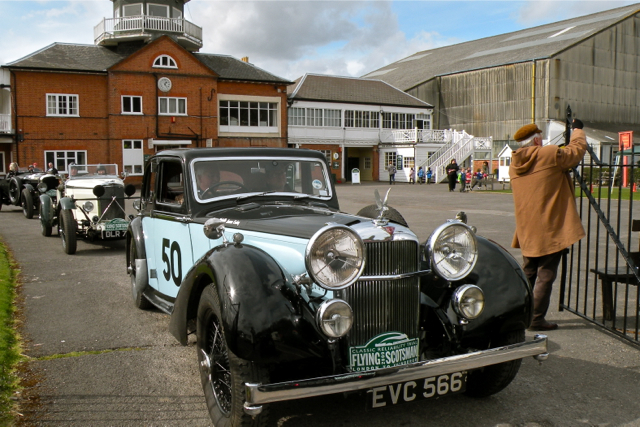 After an incident at one Goodwood Revival when a wing got damaged, we did have the outer repainted as the paint had always suffered a strange reaction and used to form small blisters in the heat which disappeared in cooler weather. 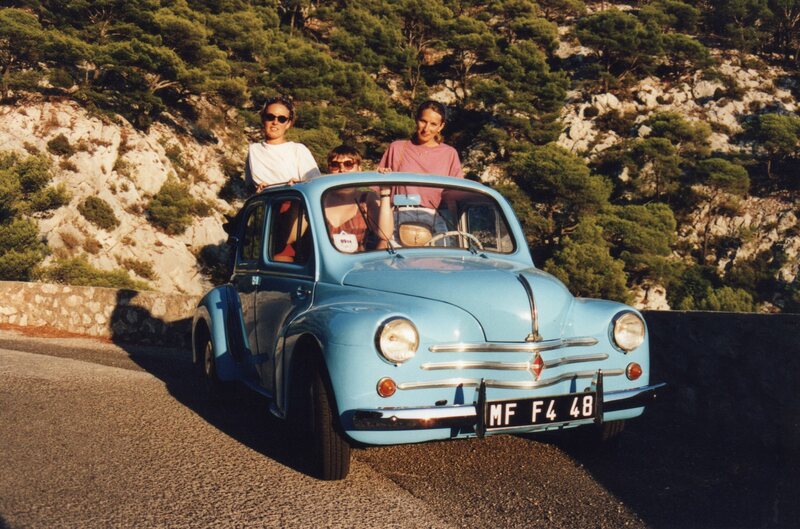 Reggie attracts attention wherever he goes and many times in France we have had to ‘park and run’ to avoid the French mob who want to tell us that that they ‘learnt to drive in one’, their Grandmother owned one, they were ‘born in one’ etc. 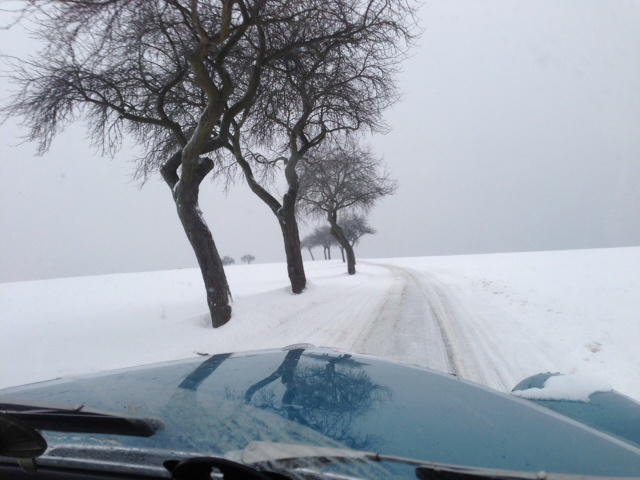 We’ve even been chased and stopped by the police on several occasions, who just wanted to take a look. 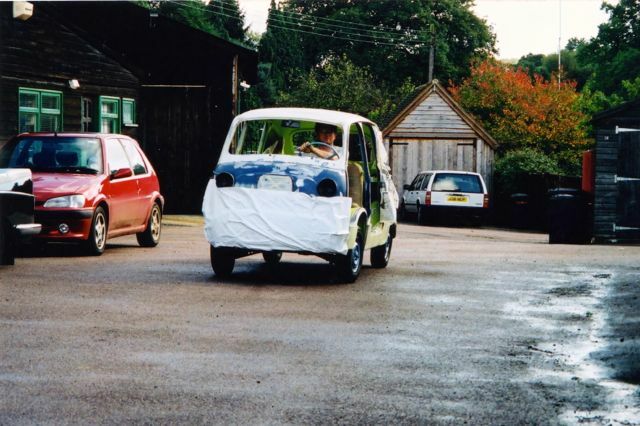 Back at home, Regie was one of the first taxi’s at the Goodwood Revival, on it’s second running in 1999 when Renault organised the taxi rank and we were invited to take part, as regular readers know was the start of another story. Regie is our ‘first born’ and is a very important member of our family who will be with us forever. 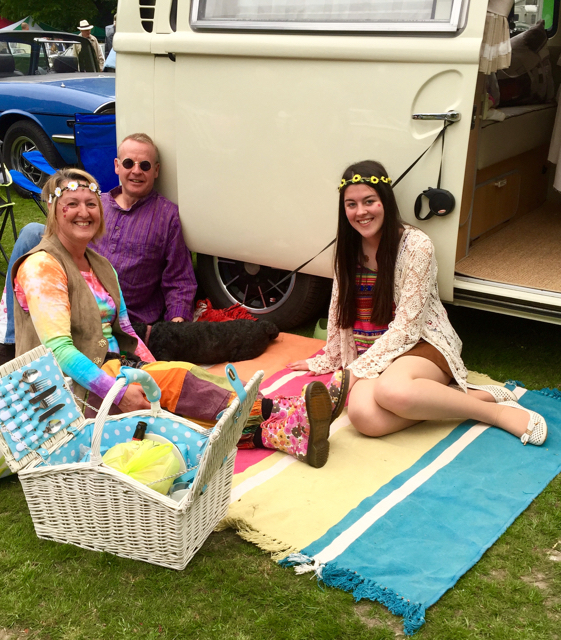 It all came together in the end… including the sun! 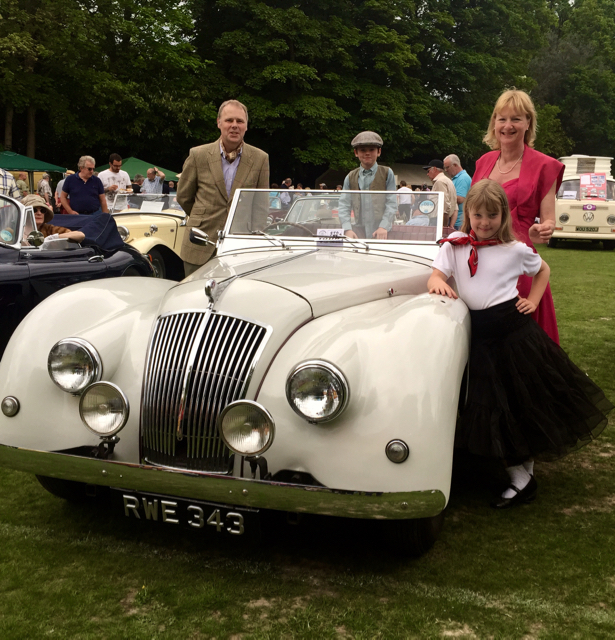 For many months now we’ve been working hard putting together plans for the Haslemere Classic Car Show and now it’s been and gone in the blink of an eye. 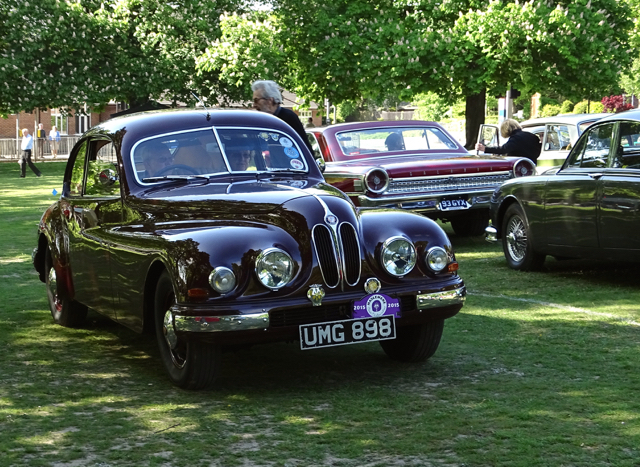 The show took place last Sunday the 25th May at Lion Green in Haslemere. We were sooooo lucky as in the middle of a rather wet spell we managed to have the only sunny day over the bank holiday weekend. 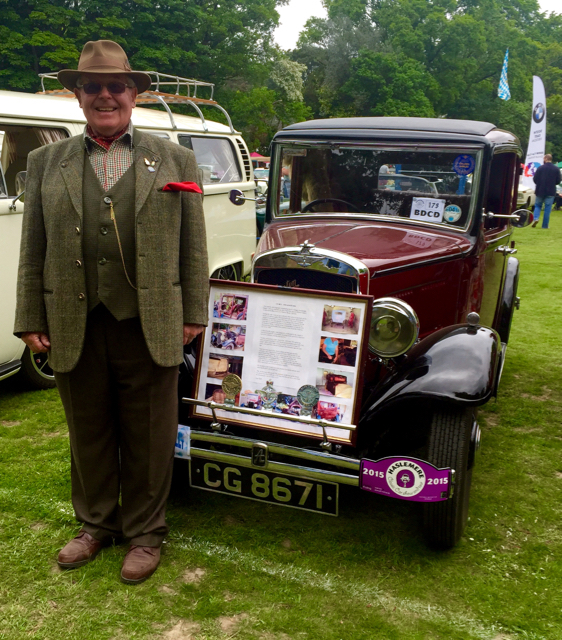 Mario who has been used regularly over the last few months to promote the show was put on display on the green the day before while we measured and marked out all the pitches for stall holders and cars. 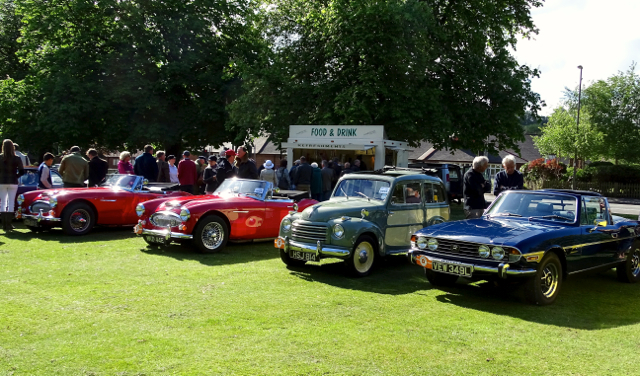 Sunday morning dawned dry and bright and everything was packed into Mario and taken to the Green, where we set up to welcome and register the classics who had signed up to go on the ‘tour’. 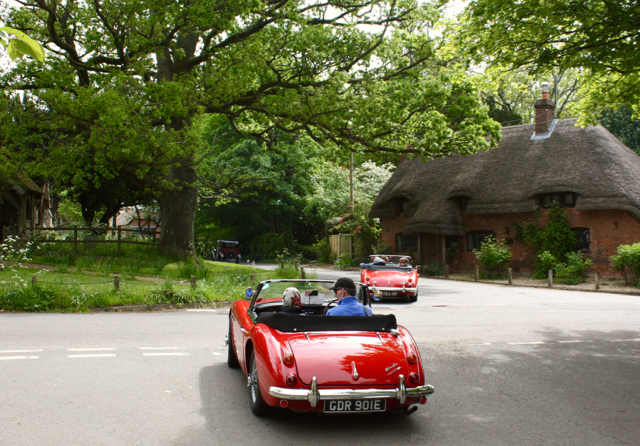 This drive round the local countryside attracted nearly 90 cars. 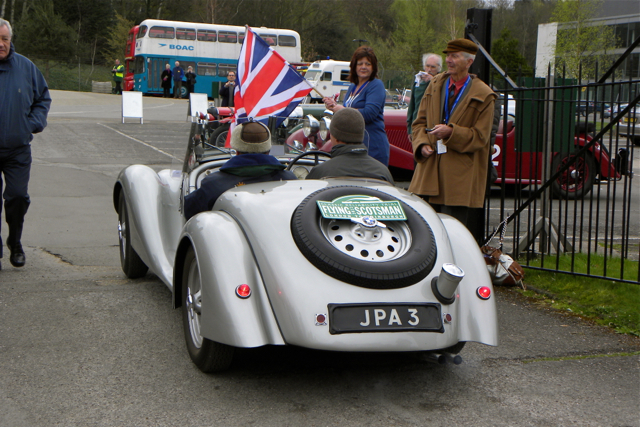 After arrival the entrants had breakfast and a natter, put on their tour plate and had their first look at the route. 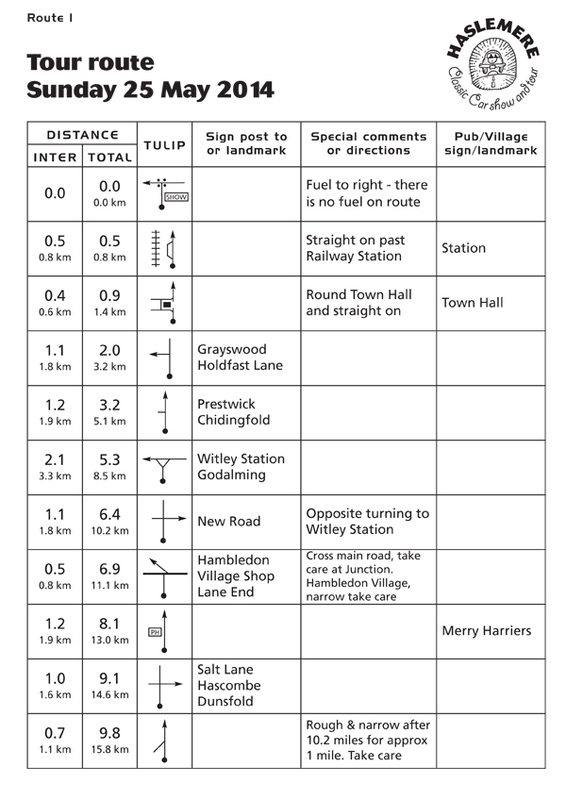 This is given as a series of tulip’s – these pictorial instructions are named as they were first used on Dutch rallies in the 50’s. 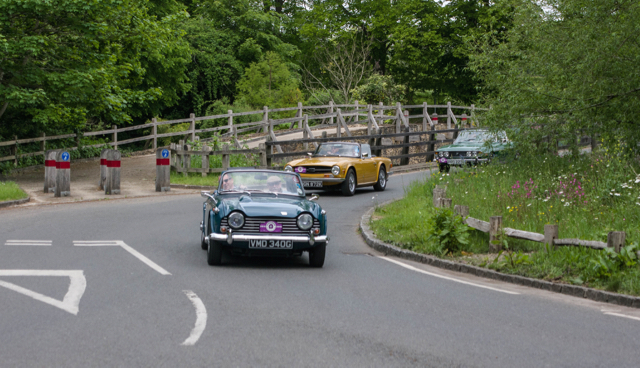 By 9.30 the cars were starting to leave on the 60 mile drive. 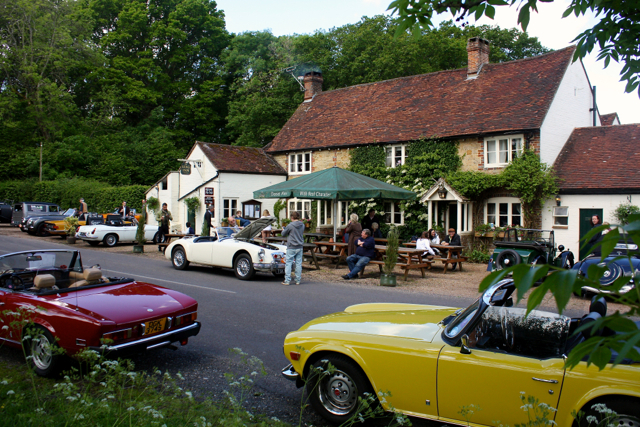 This years route followed a figure of eight, first going East of the town through Hambledon, Dunsfold, Alford and Kirdford before arriving at the picturesque Stag Inn at Balls Cross for a welcome coffee stop. 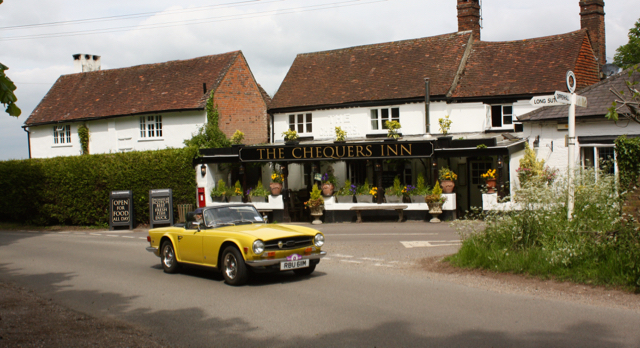 This lovely pub is our ‘regular drinking spot’ and the entrants were warmly welcomed and had another opportunity to swop motoring stories. 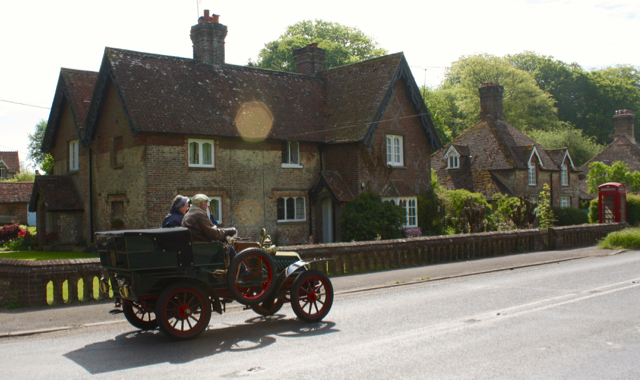 The route continued to the South through Fittleworth, West Chiltington, Wisbourgh Green and then back via Kirdford again and Northchapel to arrive back on Lion Green for the show. 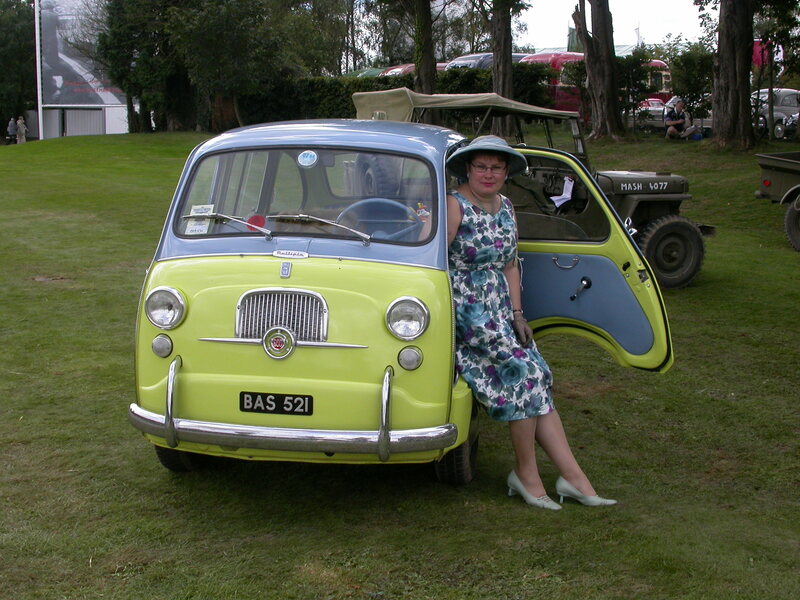 I’ve always had a soft spot for Austin A35’s, my first car was one! 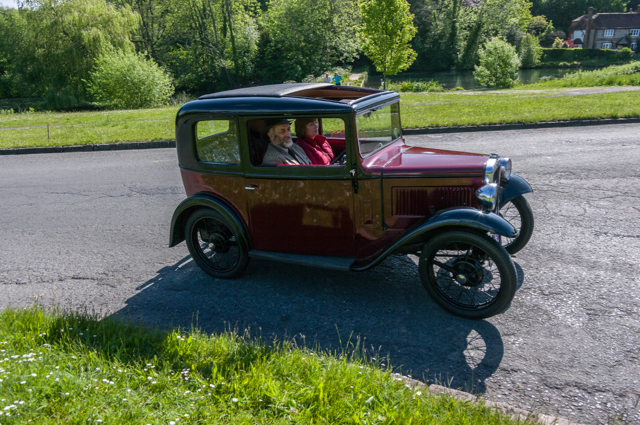 The tour first went through the town centre of Haslemere, round the Town Hall, looking rather splendid with it’s recent new roof. 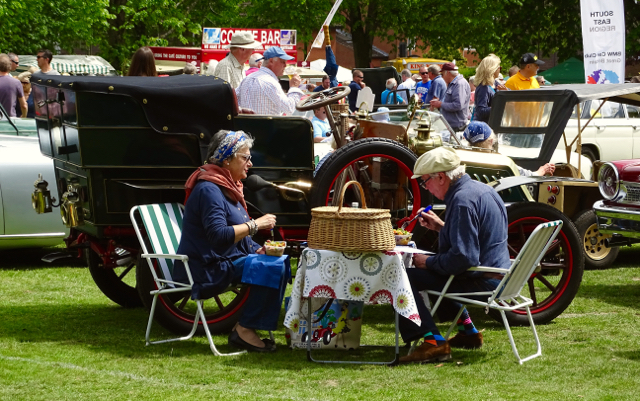 While the tour had been taking place, the Green had been a hive of activity with all the stalls arriving and setting up and the show cars started to arrive and park up. Mario was first in the queue with prime place outside the show HQ tent. 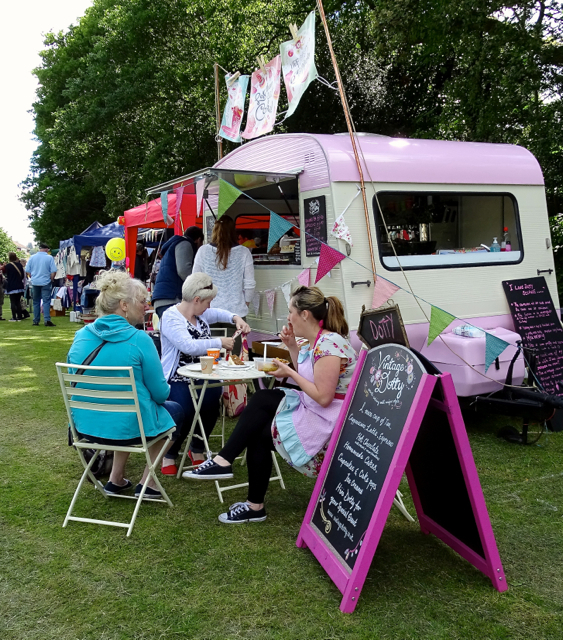 The whole feel of the day is that of a traditional vintage fete and the stalls we have reflect that, with a mix of art and crafts meet farmers market. 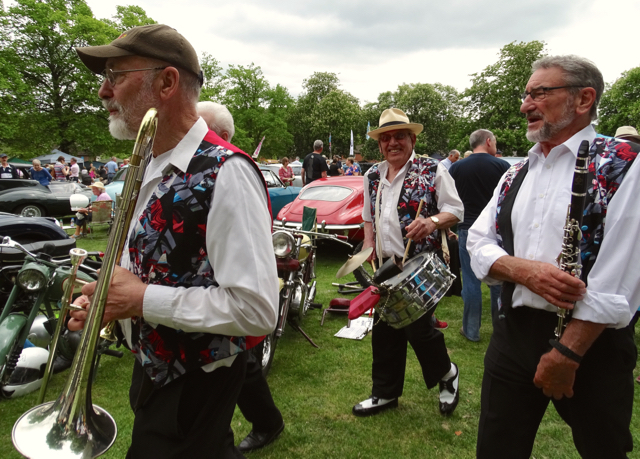 We have hot food vendors and the WI serve Cream Teas while the ever popular George Regis Jazz Band entertain the crowds. 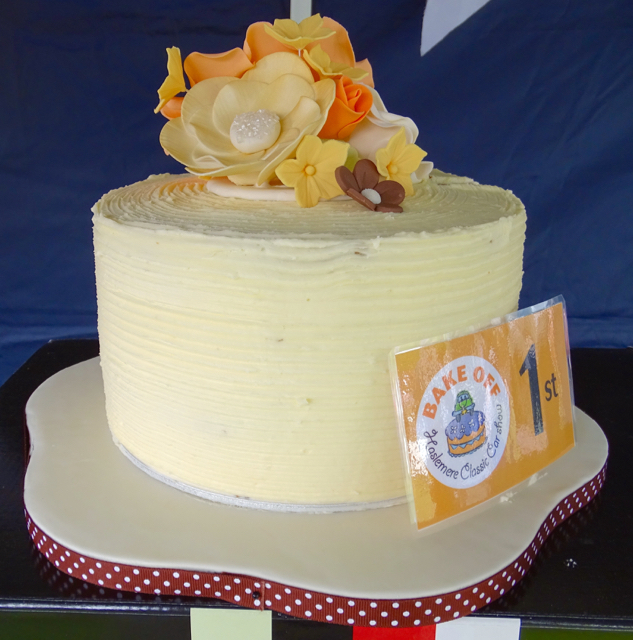 Introduced last year was the ‘Bake-Off’ competition and we were totally overwhelmed with the number and quality of the entries from adults and children. 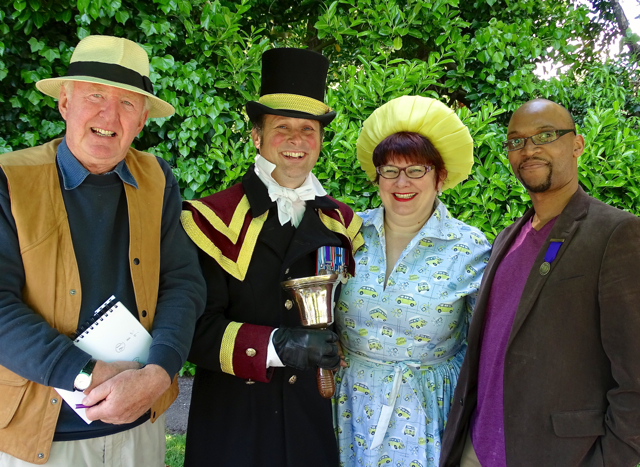 The judging panel consisted of Michael Nicholson OBE, ex ITV war correspondent, Haslemere Town Crier, Christian Ashton – who loves cake! 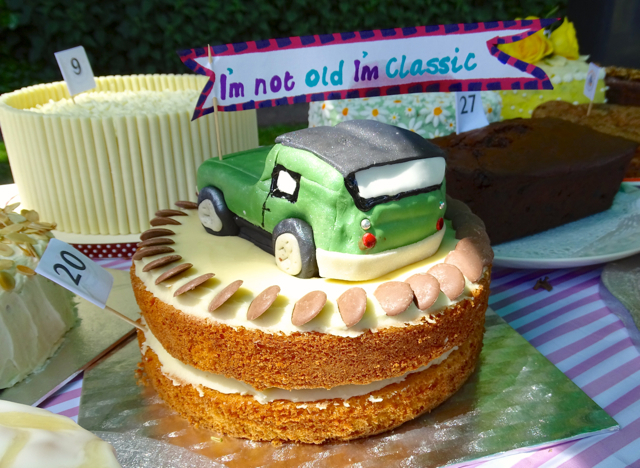 and Trevor Cruickshank, award winning cake designer. 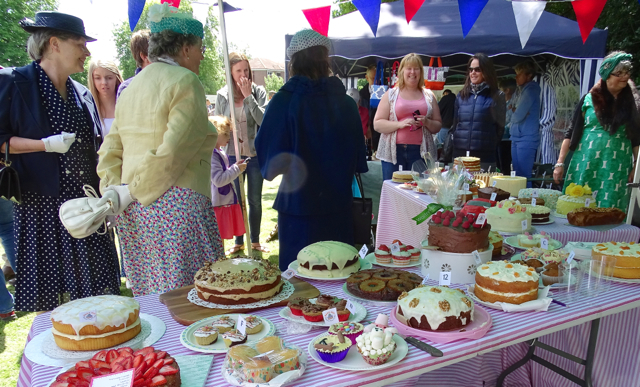 There was much deliberation and tasting of a lot of cake! 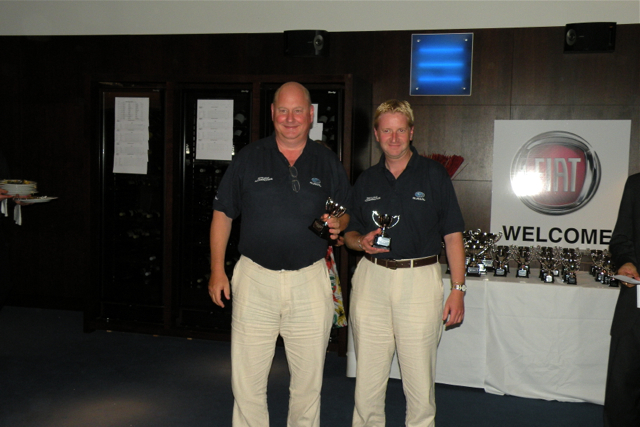 The winning adult received a K-mix mixer from our supporters Kenwood and there were lots of other prizes too. 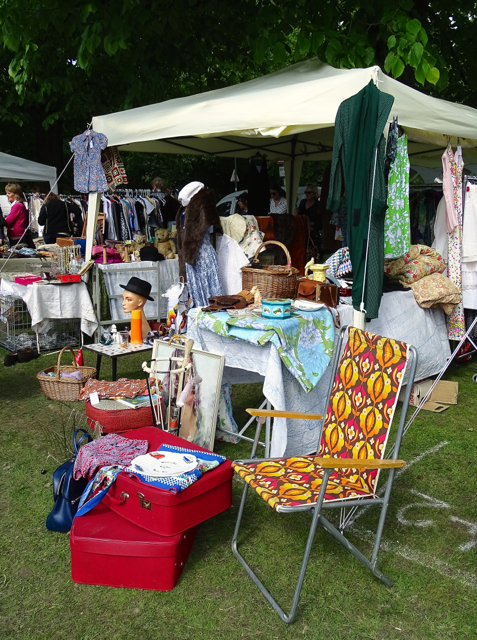 Lots of our stalls sell vintage and retro clothing and homewears. 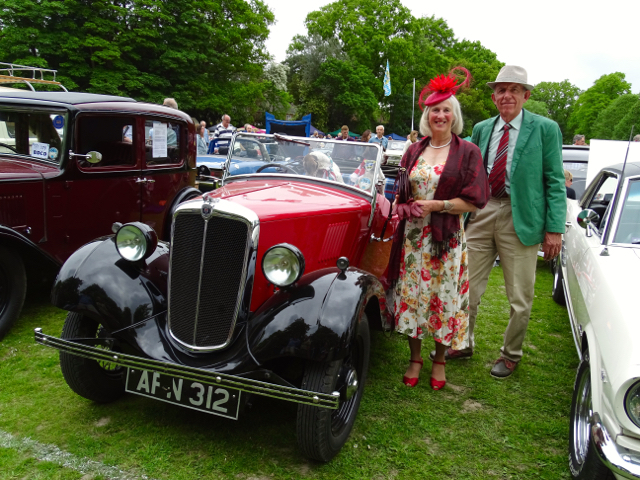 The big event of the day is our Best Dressed Car and Driver Competition where entrants are encouraged to dress in period to match their cars. 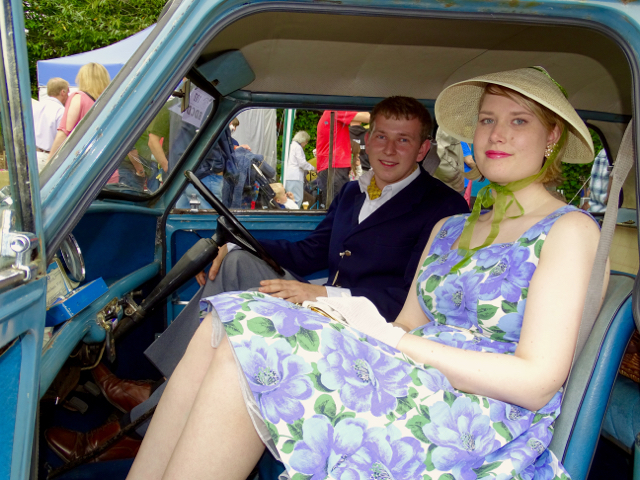 Everybody has a lot of fun and the winner gets tickets for a day at The Goodwood Revival donated by our Vintage Partners – Costume Hire Direct. 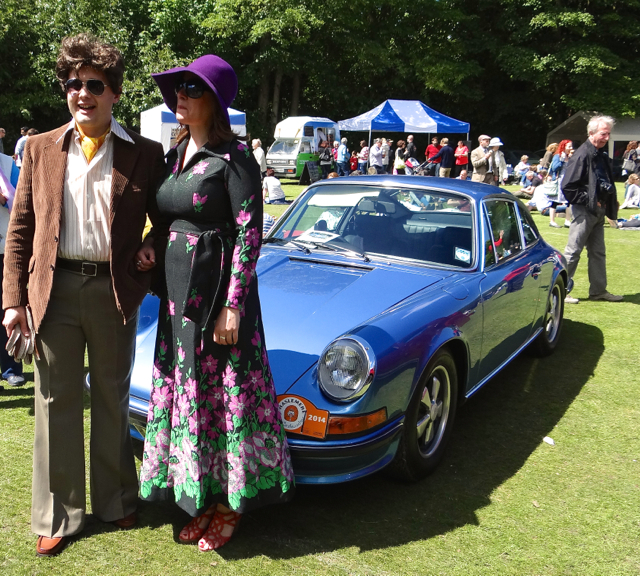 After some serious pondering by James and John the decision was made and this years winning combination was Rigby and Charlotte Andrews, dressed as a period Chauffeur and his elegant lady not forgetting Norbert the pug in their Daimler EL24 Light Limousine. 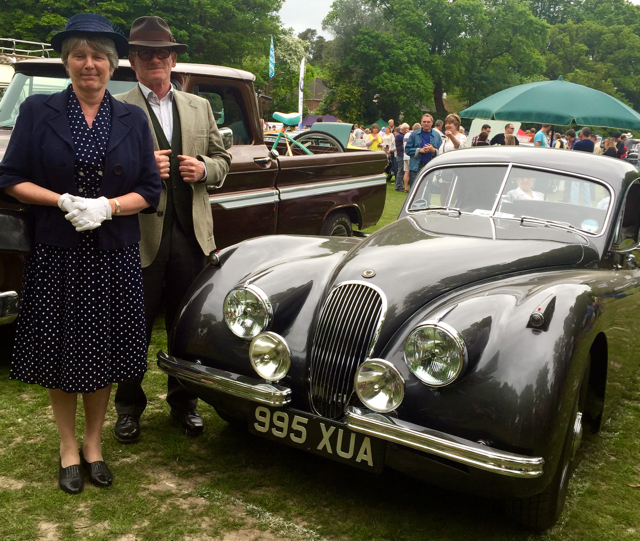 The other big competition of the day is the ‘People’s Choice’, this allows all the visitors at the show to vote for the car they would most like to take home. 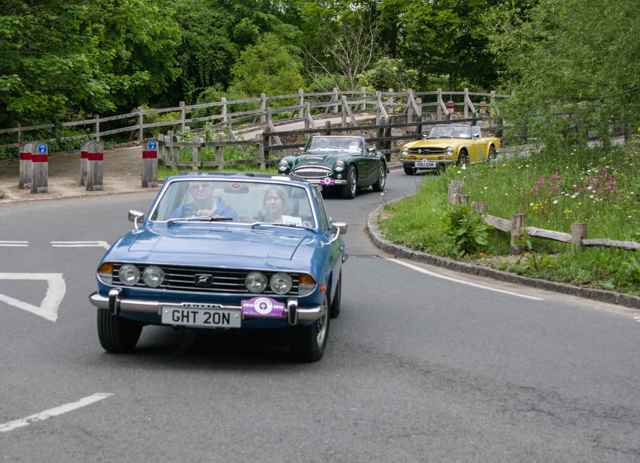 This years vote was won for the second year running by Rod Ayres from Walton-on-Thames but this time with a different car – an unrestored Triumph Stag which looked like new. 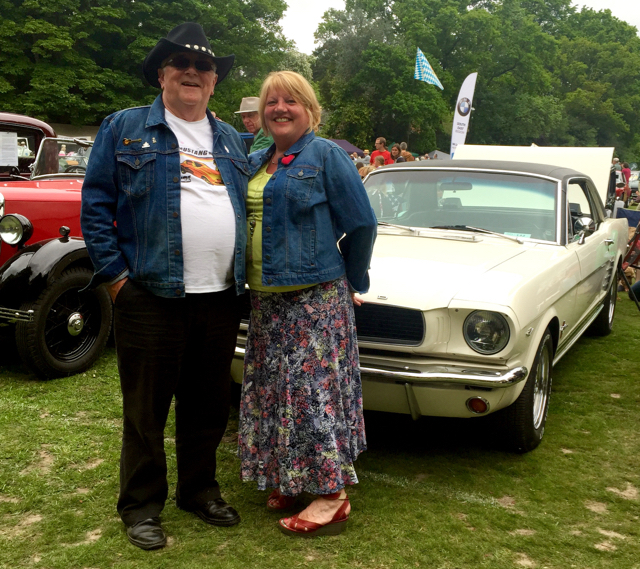 Rod also won a pair of tickets to the Revival from show supporter Walter Heale of Historic Motor Car Storage. 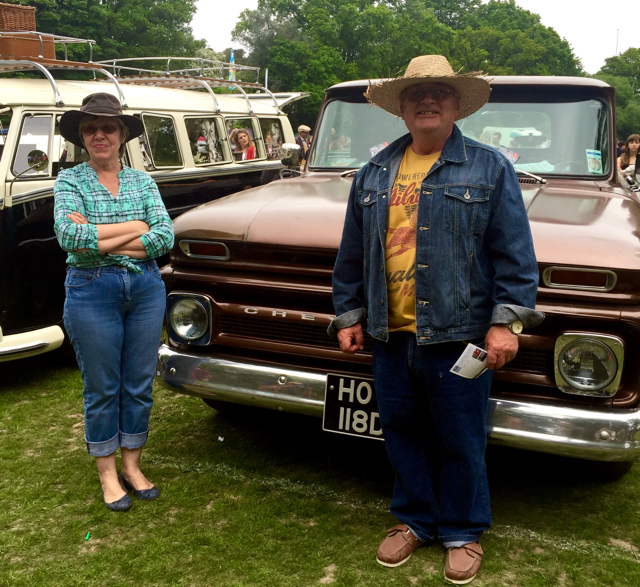 Two runners up prizes of Vouchers from American parts supplier Rockauto were awarded to Geoff Moss from Liphook in his newly restored Ford Cortina 1600GT and Mark Burch from Havant in “Hector’ a 13 window deluxe splitscreen VW camper. 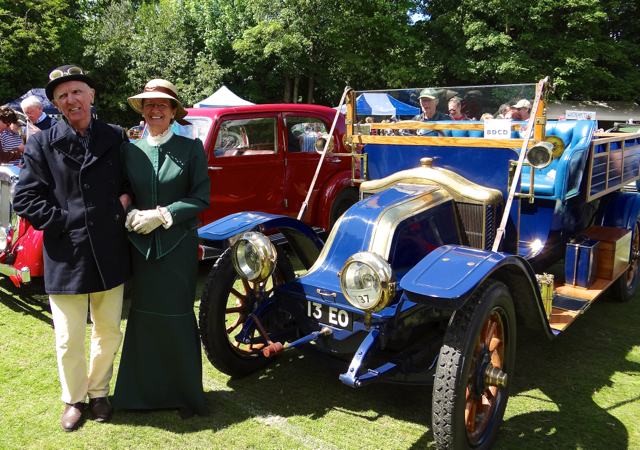 We had a amazing array of cars dating from 1913 up to the 70’s and a great enthusiastic group of people who turn up with them and display them for others to enjoy. 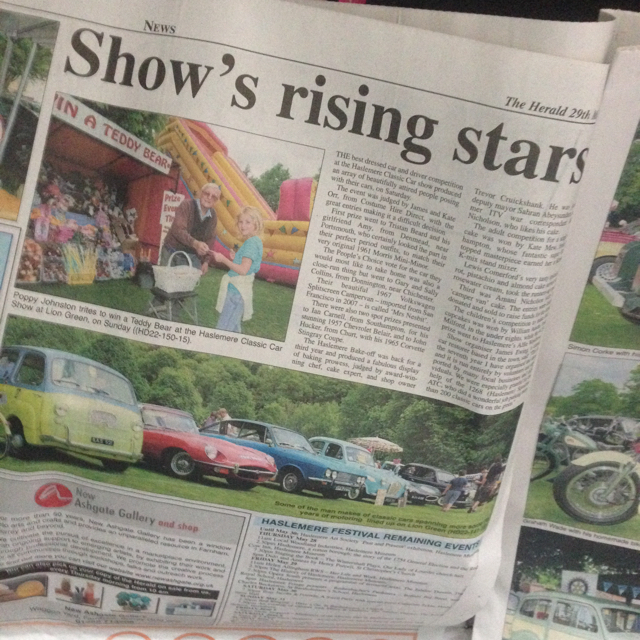 Local business’ support us by offering prizes and taking ads in our programme which we sell on the day to raise money for the show. 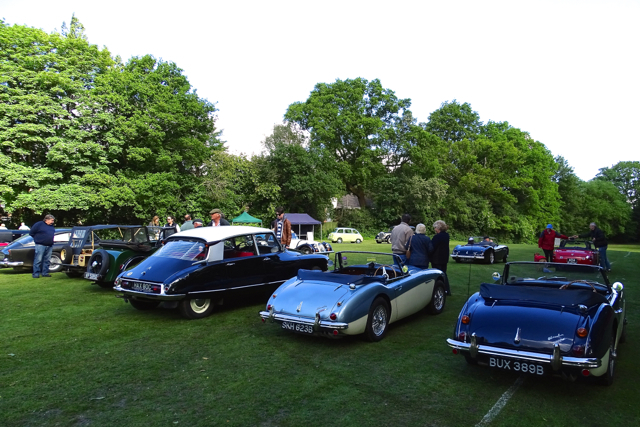 From our point of view the only downside is we really don’t get the time to look at the cars and talk to the wonderful and interesting people who turn up. 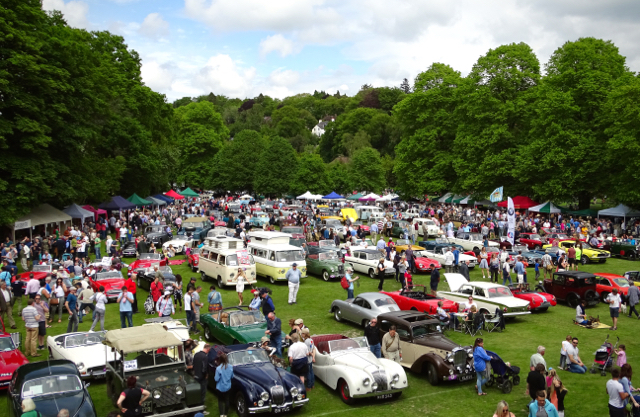 Putting on an event like this is a huge amount of work and we always go through spells of ‘never again’ but it is very satisfying to see it all come together and see people from our town and far and wide all enjoying the spectacle. 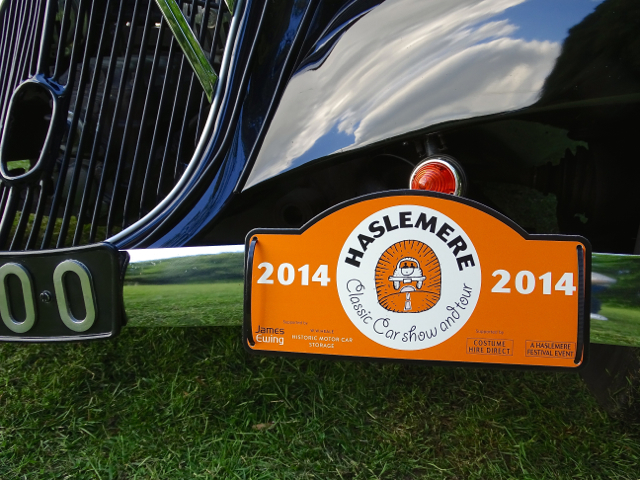 We get some amazing comments from people and that all makes it worthwhile, I’ve no doubt this time next year you will be reading a report on the 2015 Haslemere Classic Car Show! 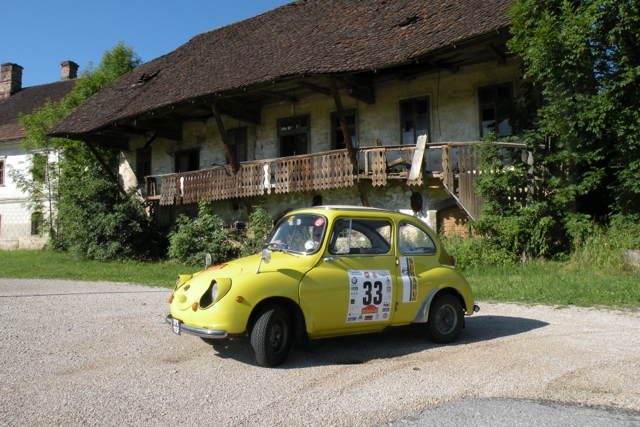 As you know Mario doesn’t go that far from home but his ‘little brother’ Nippy a 1967 Subaru 360 has been a bit more adventurous and in 2008 James drove and Jane navigated him on the Leige Brescia Leige Microcar Rally a unique event for small cars. 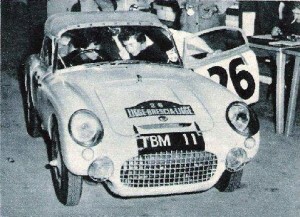 The story really starts in 1958 when in response to the Suez Crisis car manufacturers of the day entered their new sub 500cc models to prove that their performance and economy was a match of their ‘big brothers’. 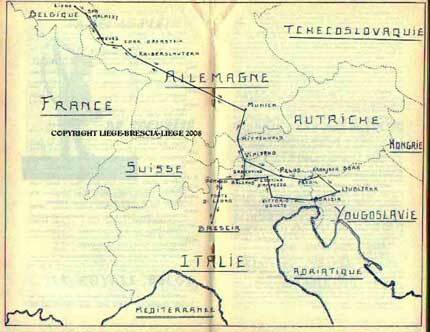 The original event was run over 3 days through Belgium, Germany, Austria, Yugoslavia and Italy. 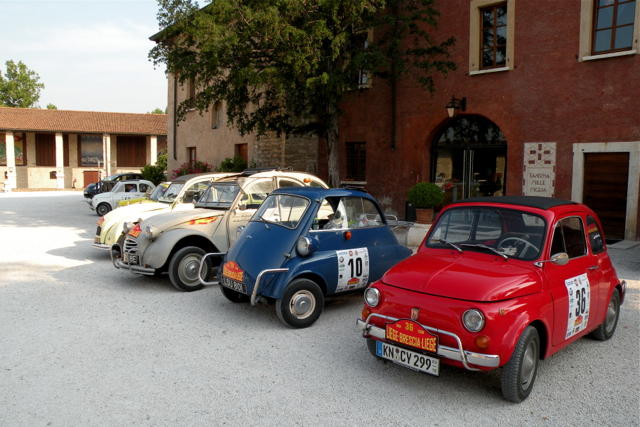 The only stop was in Brescia where the remaining entrants turned round and headed for home. 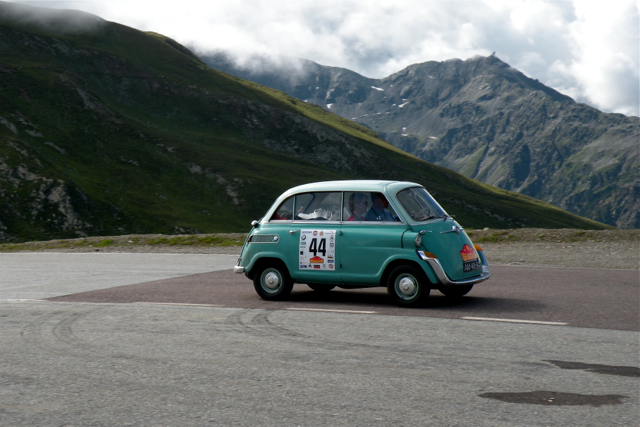 Run over a mix of terrain from the newly opened Autostrada to the dirt roads of the high passes, the event was a test of true endurance and only 13 of the original 30+ entrants finished. 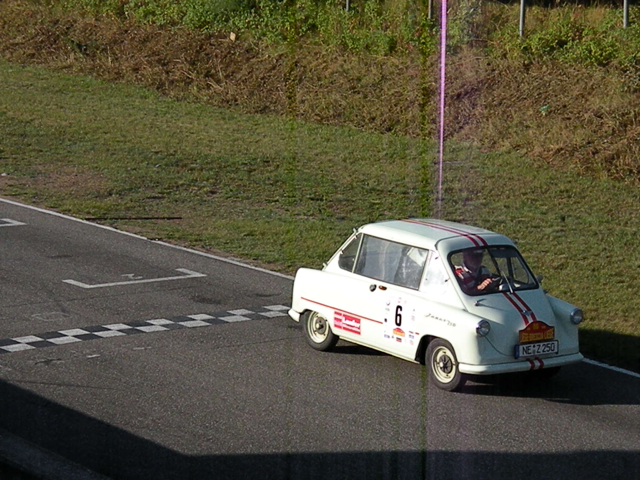 One of the cars was driven by Pat Moss and others by top competitors of the day. 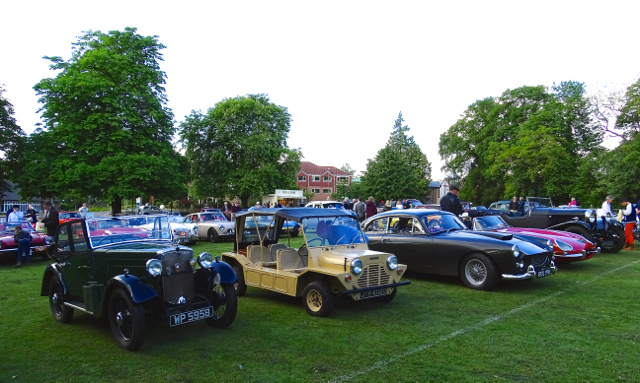 Half a century later it was decided to run the event again, although in consideration for the age of the vehicles and the comfort of the competitors the event was over 10 days. 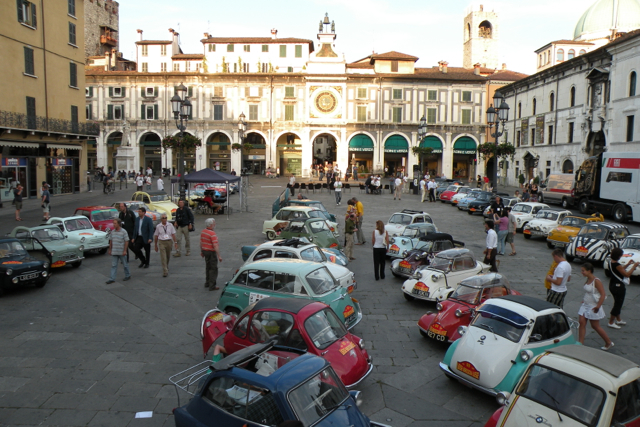 Closely following the original 2400 mile route but avoiding the motorways the rally went from Liege-Karlsruhe-Munich-Cortina-Ljubijana-Bolzano-Brescia-Bolzano-Munich-Karlsruhe-Liege and finished 50 years to the day of the original. 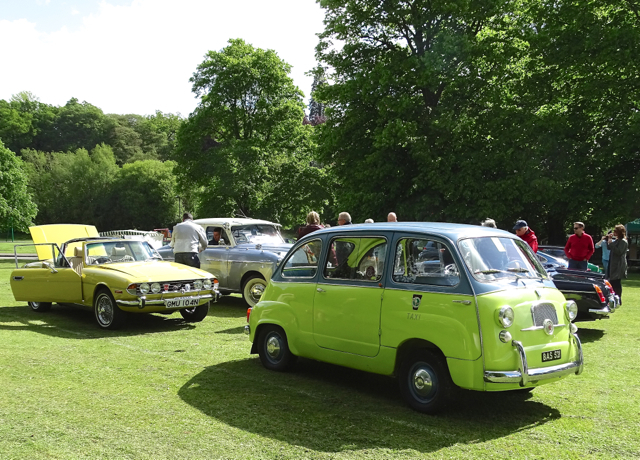 The event was organised by Malcolm McKay of Classic Rally Press. 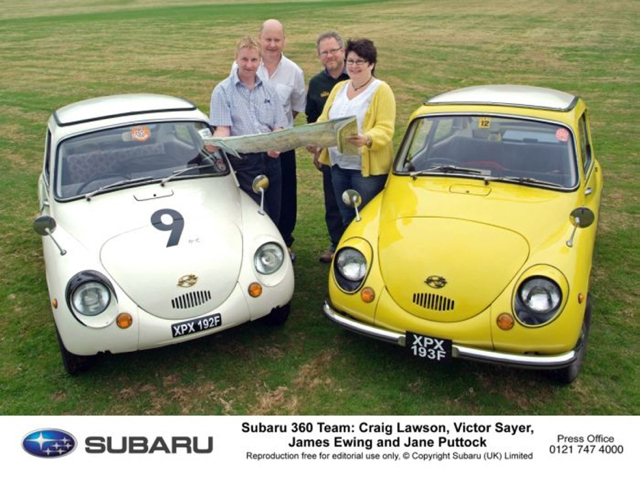 We started the event as a three car team of Subaru 360’s, us in Nippy, our friends Victor and Craig in Kato and Terry and Steve in a 360 belonging to Subaru which had recently been recommissioned. 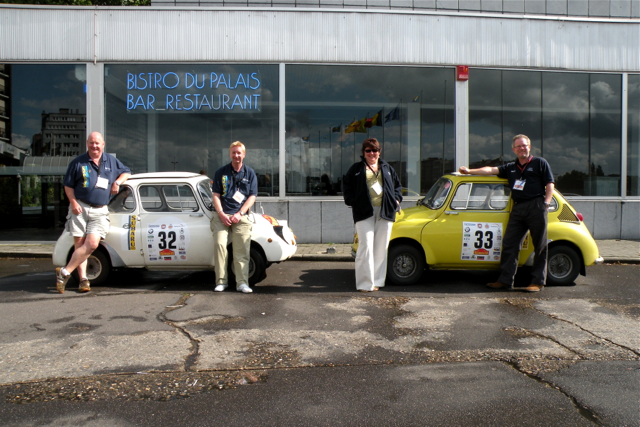 We trailered the cars to Liege and the actual event set off on July 10th 2008. 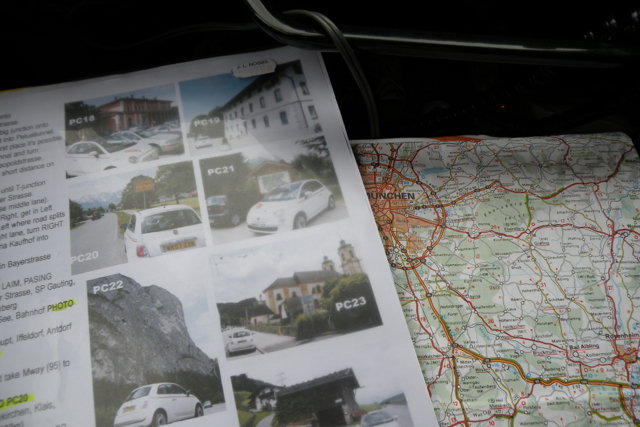 The event was a navigational exercise with photo checkpoints, we had to take identical photo’s showing our car to prove we had been there and completed the whole route. 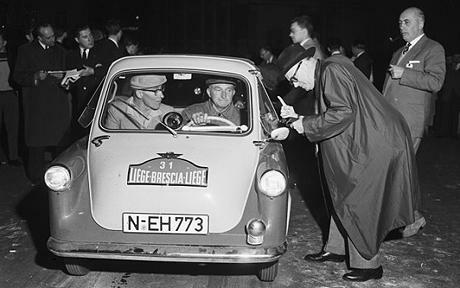 58 cars started the event including Fiat 500, BMW Isetta and 600/700, Berkeley, NSU Prinz, Goggomobile, Vespa, Messerschmitt, Citroen 2cv, Zandapp Janus and Heinkel. The weather was terrible with teaming rain which was to last for the next 4 days. 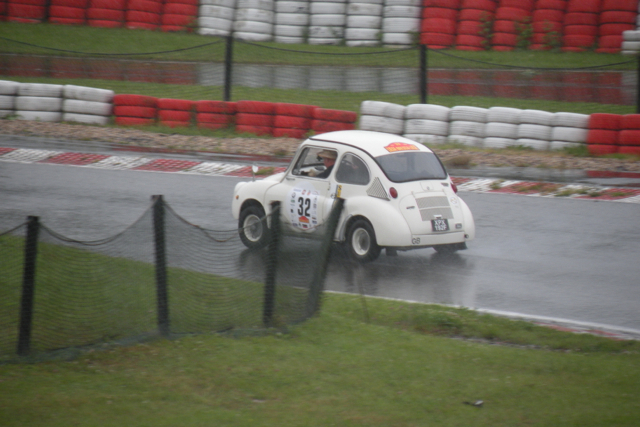 Our first stop was at Spa where we did some very soggy timed laps of the Kart Circuit. 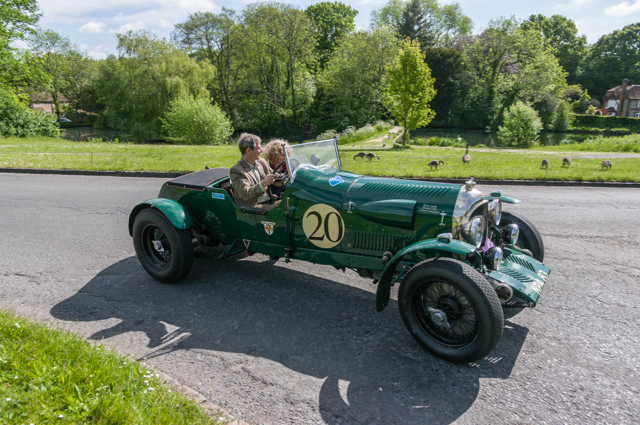 A long drive followed and Jane on her first rally, soon learnt the rally rules – you only stop when you can do everything at once – refuel, eat, drink and pee! 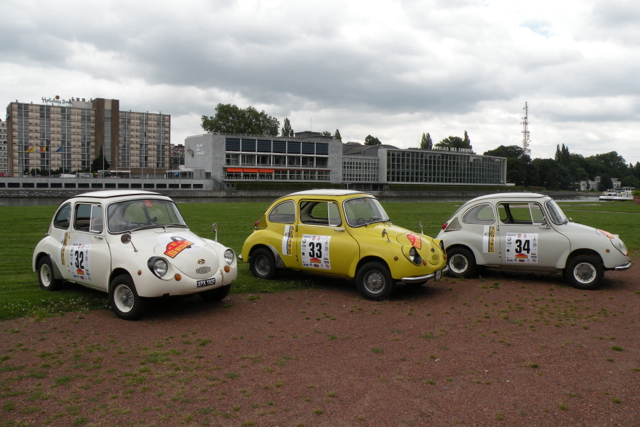 We crossed the Rhine and arrived at the first stop in Karlsruhe. 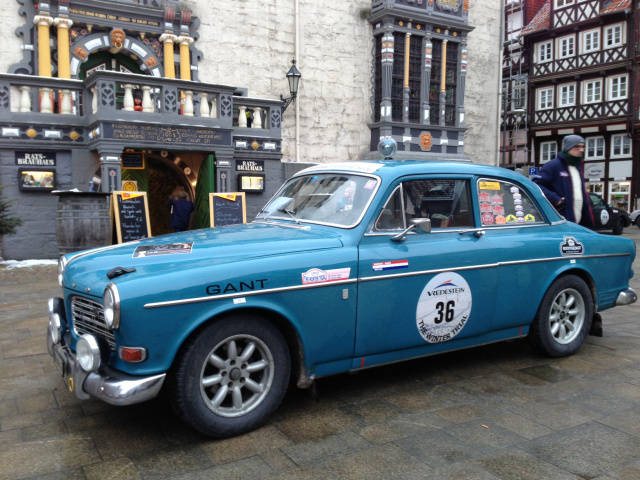 Unfortunately the third Subaru had been having problems all day, they finally arrived at the hotel on a tow truck after Midnight, James set to work and took the engine out but it was a terminal problem and they had to retire. 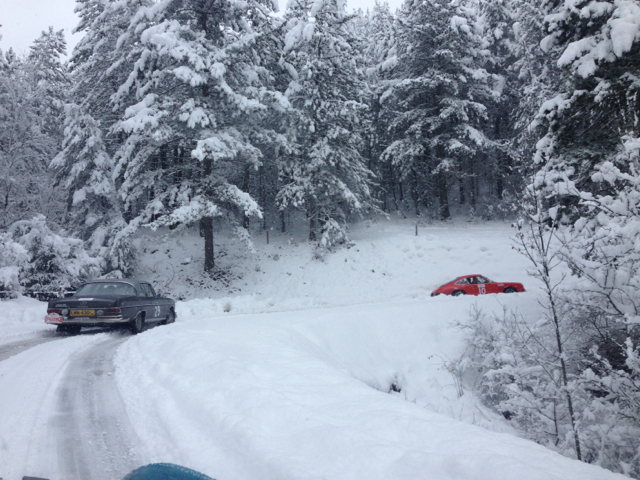 Team Subaru was down to two cars. 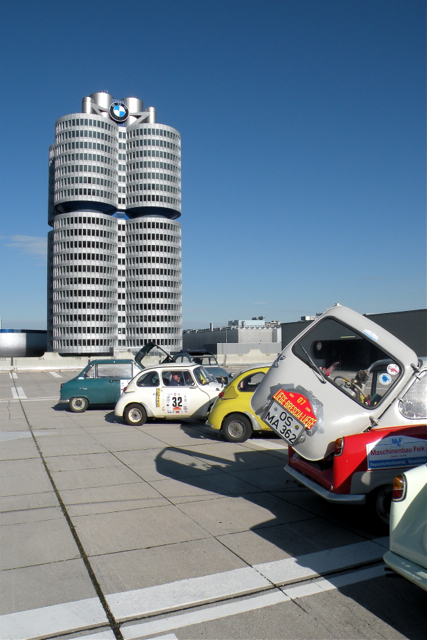 Day two was another test on a local kart circuit, followed by a day of tricky navigation to arrive at the BMW museum in Munich. 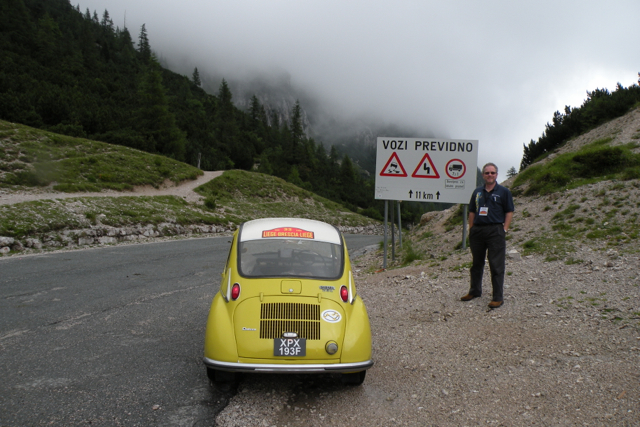 From Munich we travelled through the Black Forest and into Austria and over the Brenner pass into Italy. 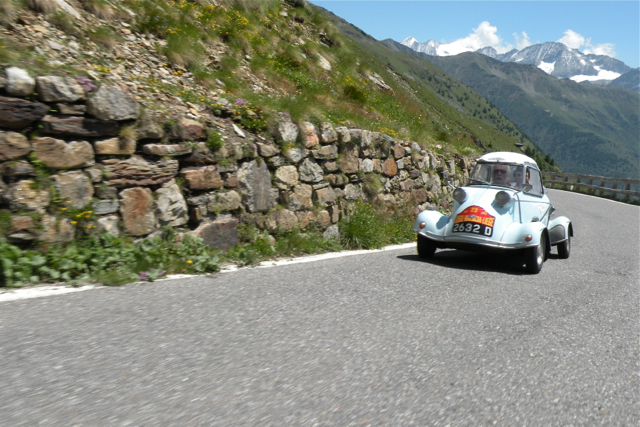 At 1375m this was our first real pass and our first opportunity to see how the ‘little’ cars performed – we were pleasantly surprised. 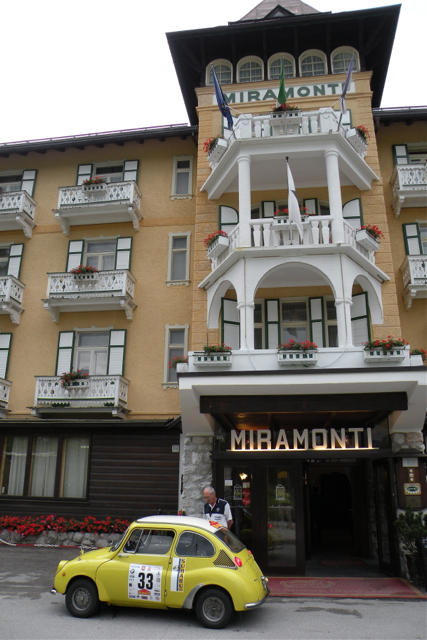 We arrived in Cortina at the splendid Hotel Miramonti Majestic Grand, a great setting for the little cars. 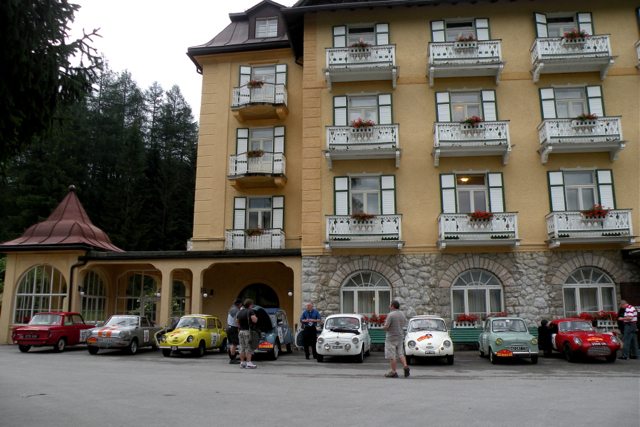 We were now high in the Dolomites and day four included several high passes to reach the Slovenian border, some of them driven in heavy hail storms and as many of the hairpins were still traditionally cobble stones it wasn’t the most comfortable journey. 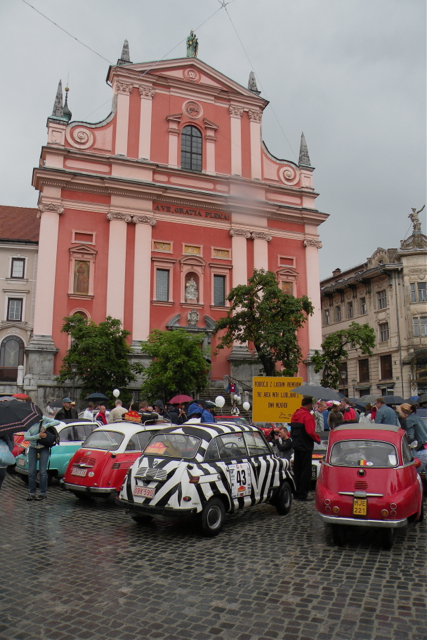 The rally spent the night in Ljubljana, a fantastic city.We were allowed to park the cars up in the famous Preseren Square where they attracted a great deal of attention including TV crews covering our arrival. 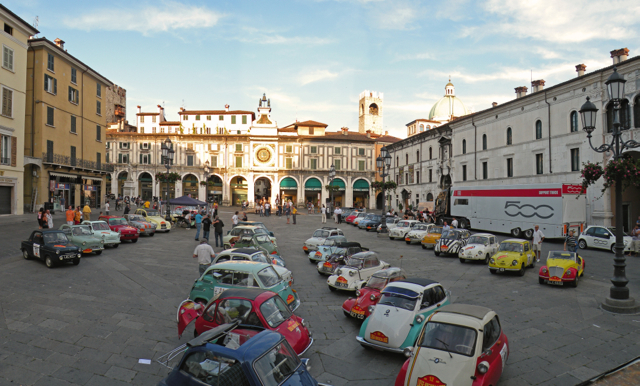 The next morning we finally had sunny weather as we crossed back into Italy and a lovely lunch stop at a great family museum. 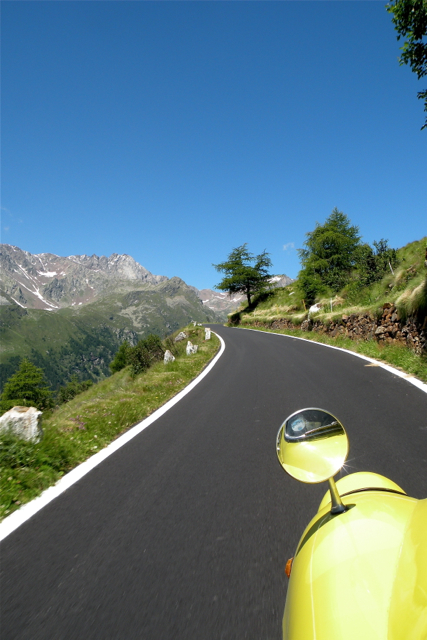 Three more passes including Passo di Pordoi 2239m. 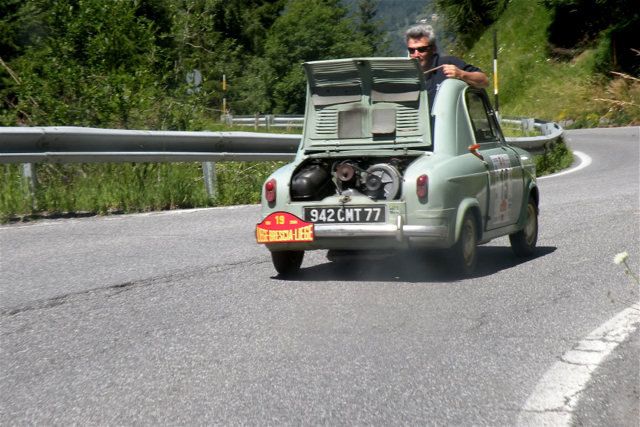 Many of the field were late into Bolzano and lots of fettling was required. 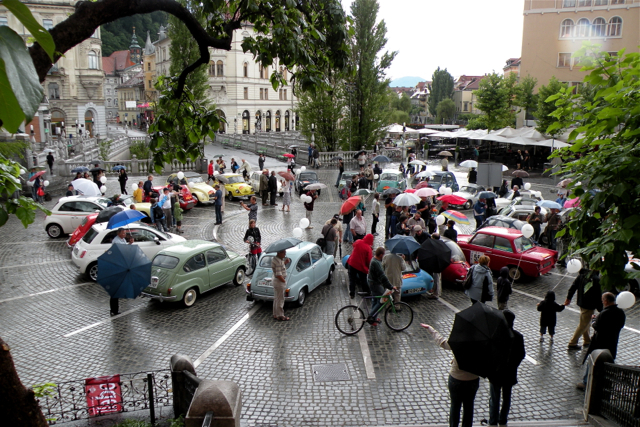 The Isetta didn’t make it until 5am after having to make major repairs in Ljubljana. 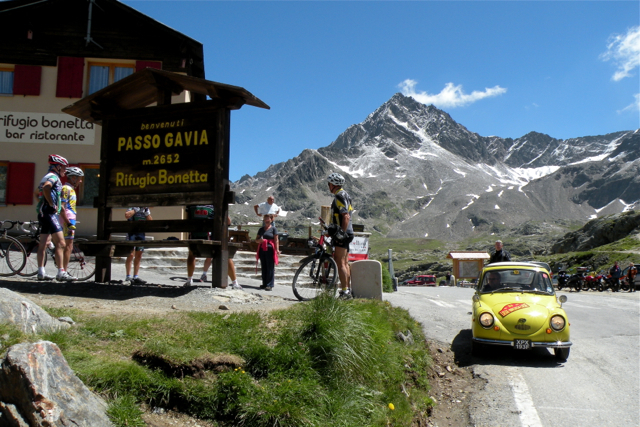 Dissappointingly due to all the storms, the Stelvio pass was closed with a landslide but after a deviation we managed to double back and still climb the Gavia from the Southside and get the Passage Control photo at the summit, at 2621m it’s not much lower than the Stelvio 2757m. Once back down it was a very pleasant run along the shores of Lago di Iseo and into Brescia. 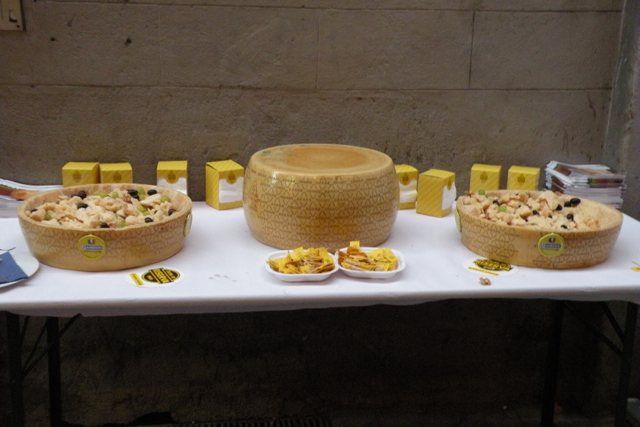 In the town we were welcomed with a civic reception with all the cars in the main square as on the original 1958 event, they even ‘broke the cheese’ where a whole Grande Pandano was opened for us to taste, a great honour. 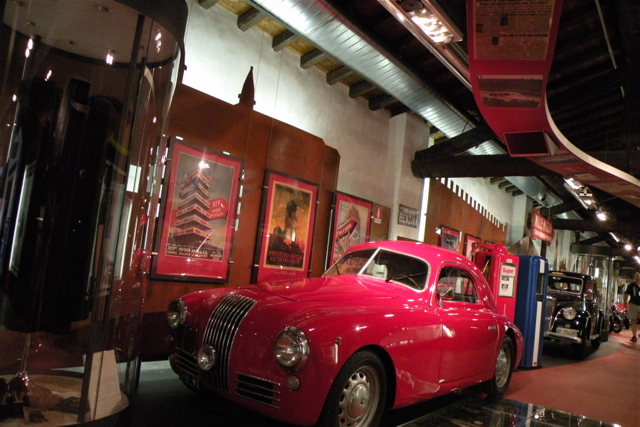 Day 7 started with a trip around the impressive Mille Miglia museum and then set off back to Bolzano, actually managing to stop for lunch on the way. 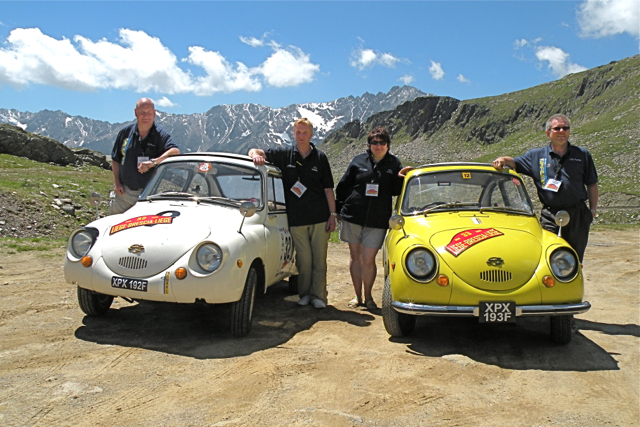 Getting out of Bolzano the next morning wasn’t easy but we were soon climbing the Passo Pennes at 2215m it was one of the best of the rally. 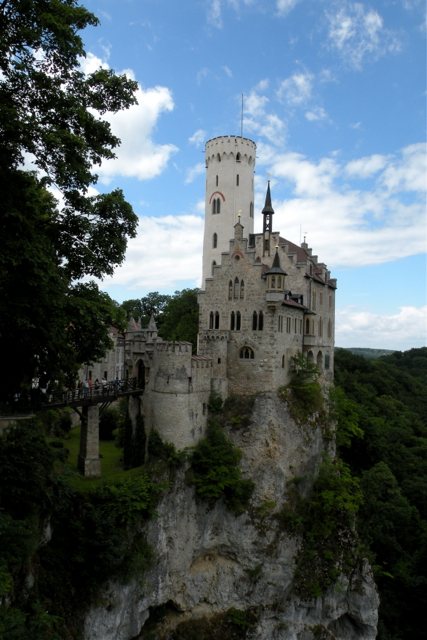 After another night in Munich we had a lovely drive through the German countryside with several stops at motor museums and the impressive Schloss Lichtenstein, this fairytale castle perches on a steep cliff and is a spectacular sight. 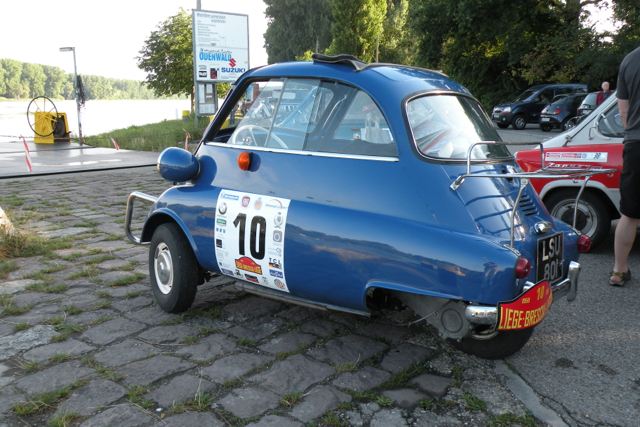 The final day saw us back at Karlsruhe kart circuit where we had much better times in the dry, although by the time we’d got back through Spa in the afternoon it was inevitably raining again. 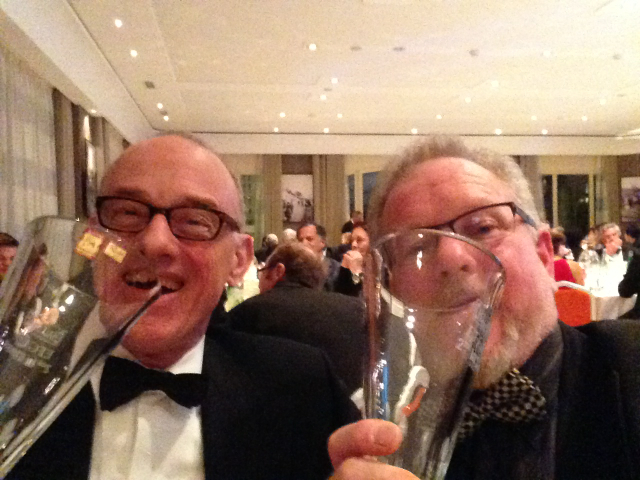 We finished back at Liege for the prize giving. 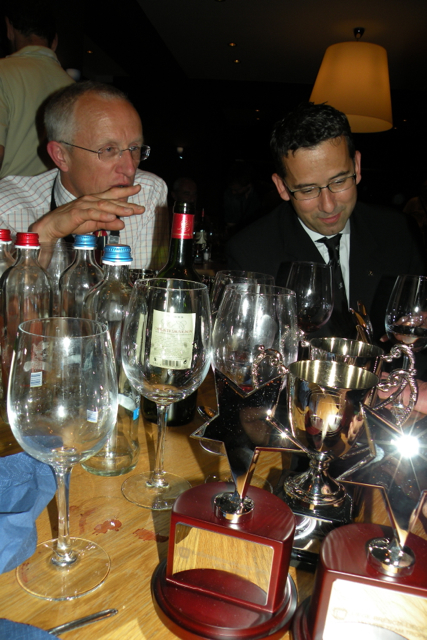 We won our class with Victor and Craig second and Jane won the Ladies prize so a very successful evening with a lot of celebrating. 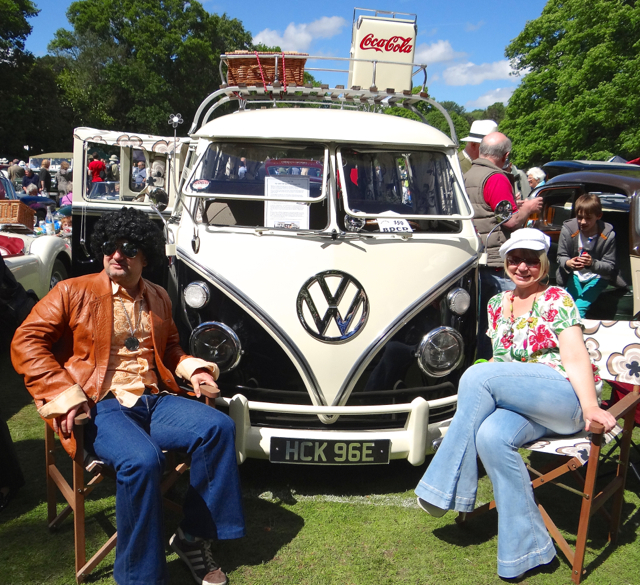 We all had a great time even though we were a bit tired and grumpy at times. 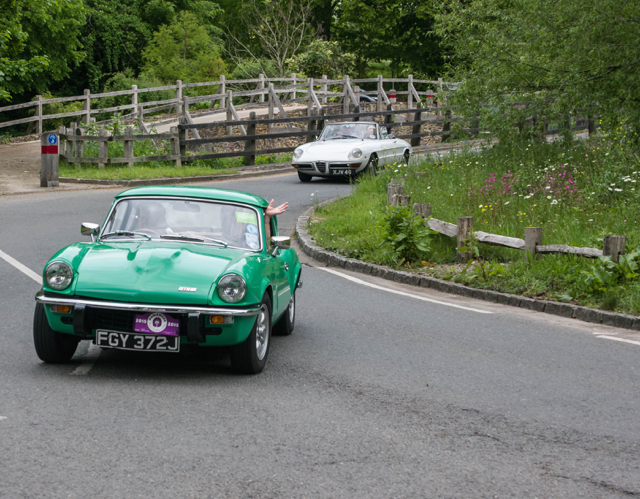 The event although quite straightforward for James was a challenge in such little cars and Jane enjoyed her first event and got into the spirit of classic rallying. 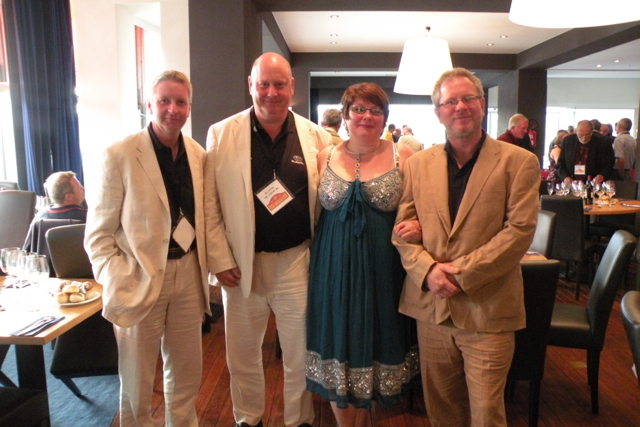 We all enjoyed it so much that we did it again a year later but that’s for another blog. 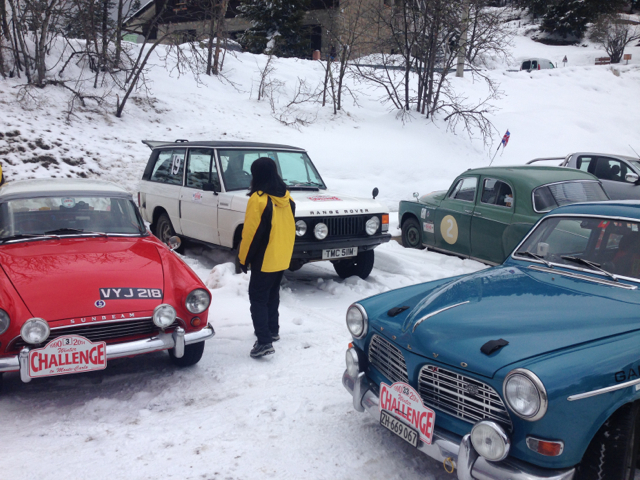 James and Herman have completed the Winter Challenge from Troyes to Monte Carlo and have had a very successful week. 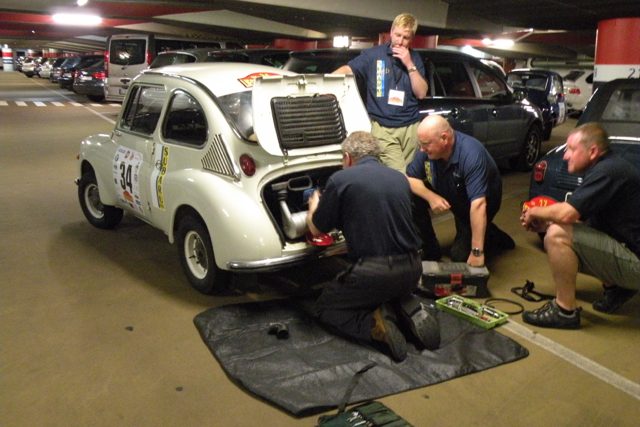 They finished 9th overall and collected a 2nd in class award. 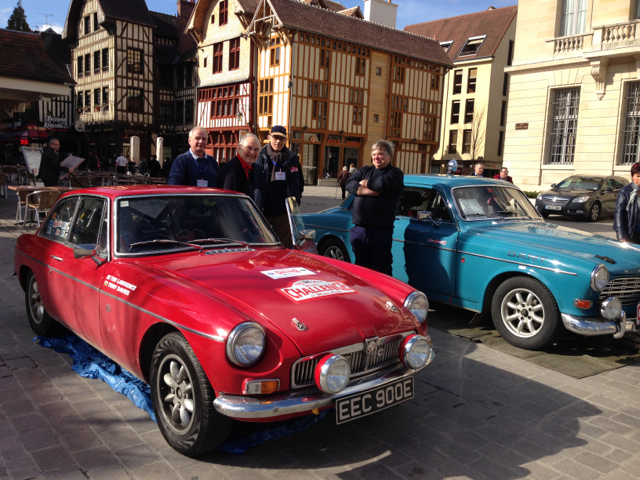 The rally left Troyes last Sunday and after an overnight halt at Chartres met up with the english starters at Le Mans and then onto Bourges. 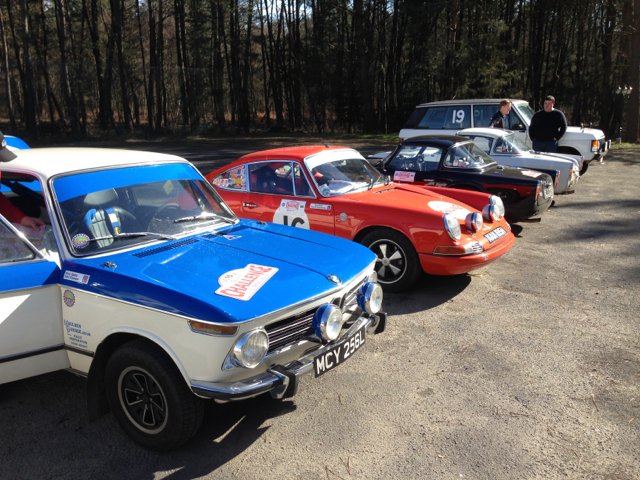 The first full day was in warm sunny spring conditions and not at all like a winter rally should be. 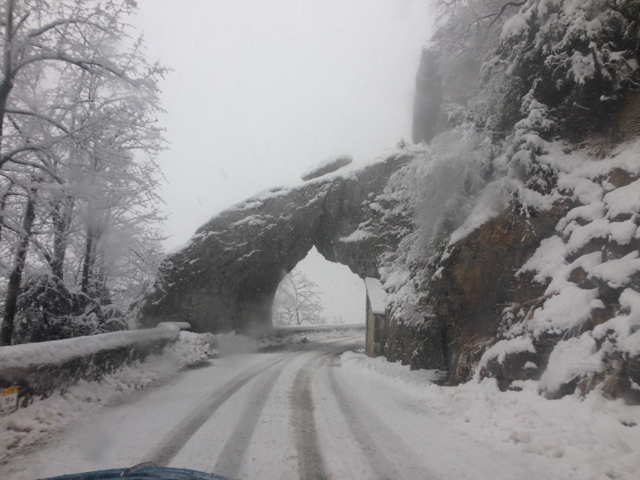 Tuesday was a long day of tricky navigation running into the evening, where fog made the route especially difficult as the headed to the overnight stop in Valence. 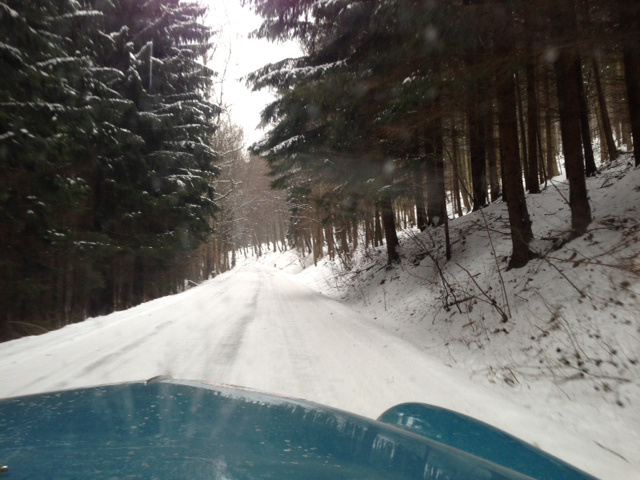 Wednesday morning finally brought proper winter conditions with 8 inches of snow but again as the rally moved South it again became dry. 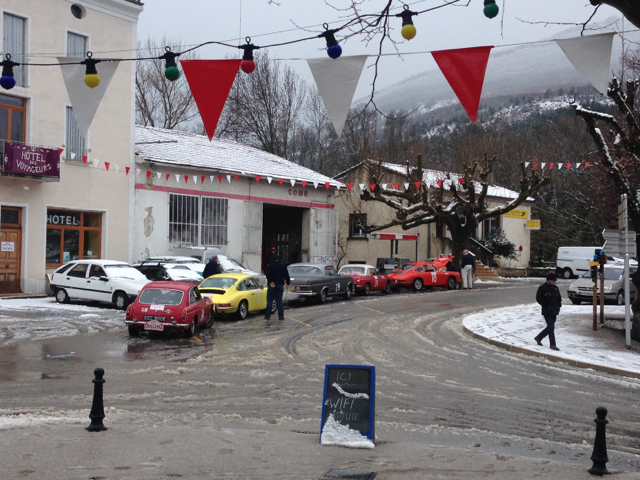 The final day finished on the famous Col du Turini with snow again but the roads were cleared. 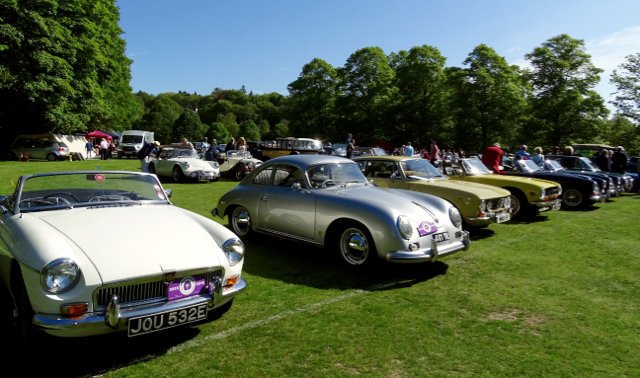 The event was won by the Dutch Crew of Jan Ebus and Jan Berkhof in their Porsche 356, James and Herman have come up against this very committed crew on several previous Winter Trials. 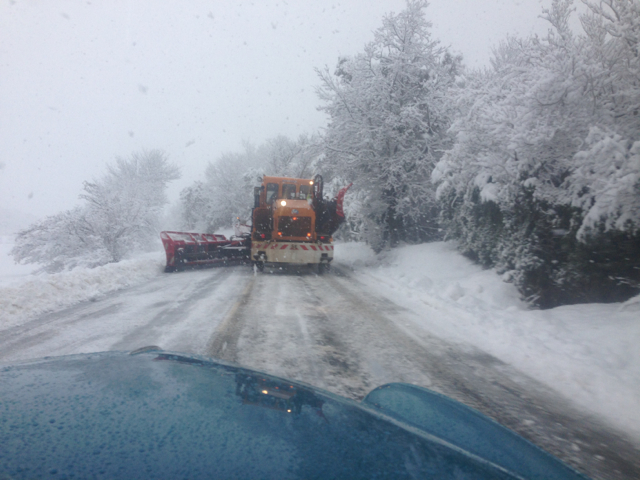 James has previous of Overtaking the snow plough! Mario’s human (and chief medic!) 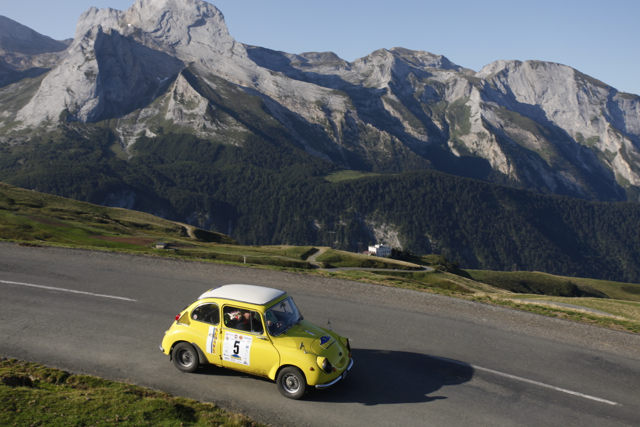 James has set off to take part in the 2014 Winter Challenge which starts on Sunday from Troyes, South East of Paris and meanders it’s way through the mountainous areas of France to finish in Monte Carlo next Thursday having hopefully completed some of the most famous Cols in rallying history. 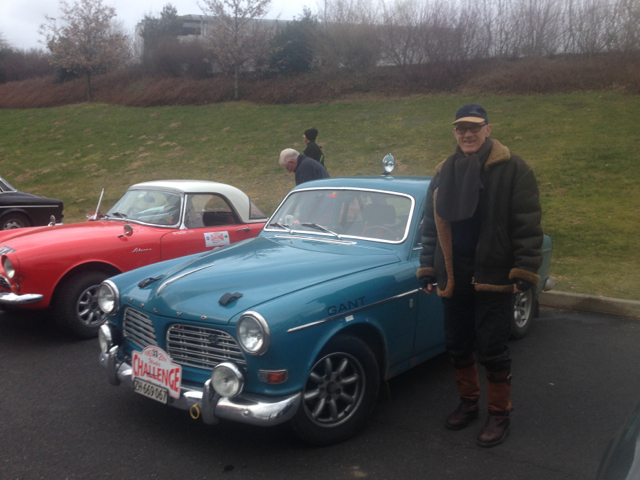 James is navigating for Dutchman Herman Mass in a 1967 Volvo 122S. 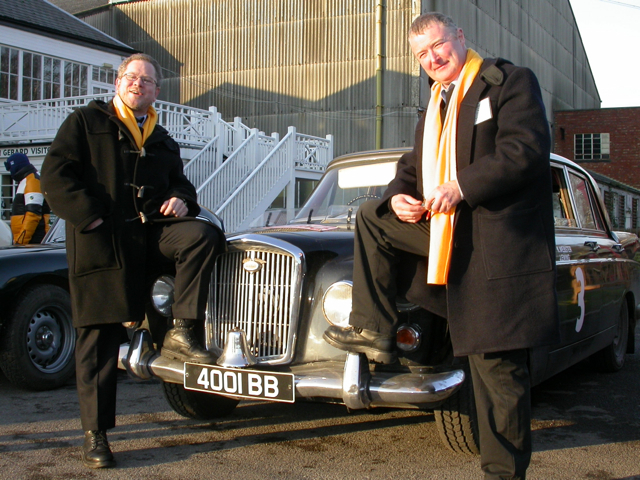 They have been a successful team for a number of years taking part in various Winter Events. 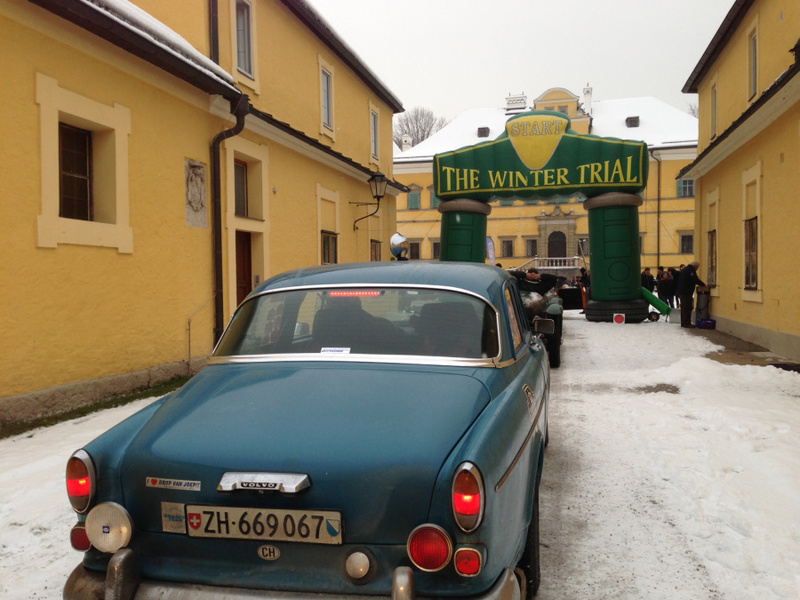 Previous years have seen them on the Winter Trial which takes place in January with routes all over Europe from Eastern Holland, through Germany, Poland, Czech Republic, Romania, Austria and Italy, meaning they’ve often found themselves in very snowy and icy conditions. 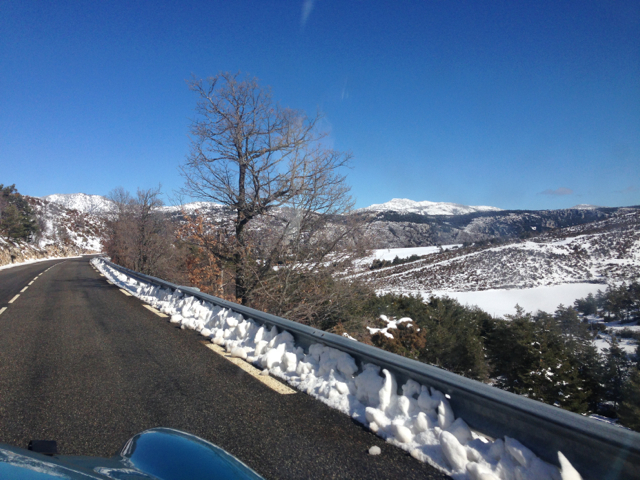 It’s not looking like they are going to get such harsh winter conditions on this years Winter Challenge route through France and so James’ position as navigator will be much more important, one wrong slot could make all the difference on the road. 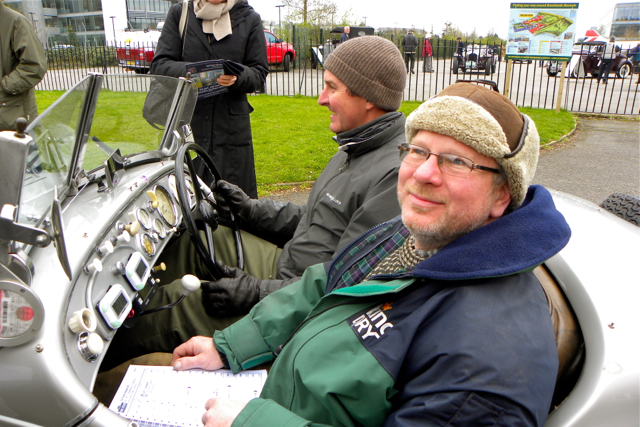 James has spent the last couple of weeks busily plotting the route onto his maps, it looks like there will be some rather tricky navigational sections, hopefully they will do well – always a bit of a dilemma, I want them to succeed but you should see some of the trophies they bring home! 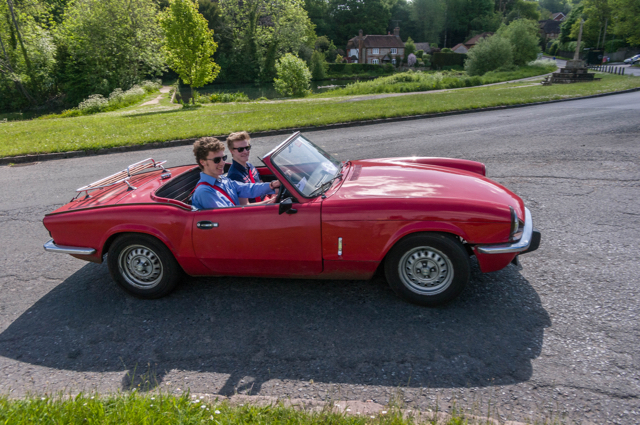 You can follow their progress on the official site or James will be writing his own blog – ‘Dickingaroundwitholdcars‘ – where possible. 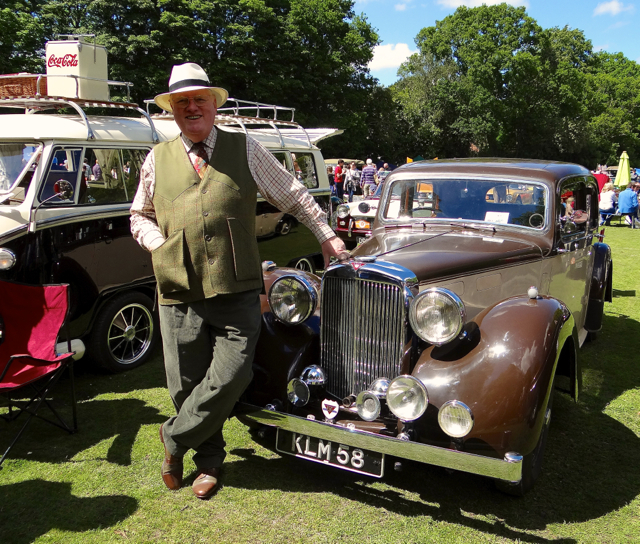 James started off taking part in classic rallies more than 25 years ago initially as a driver, in an Austin A35, Mini, Hillman Minx and a pre-war Riley. 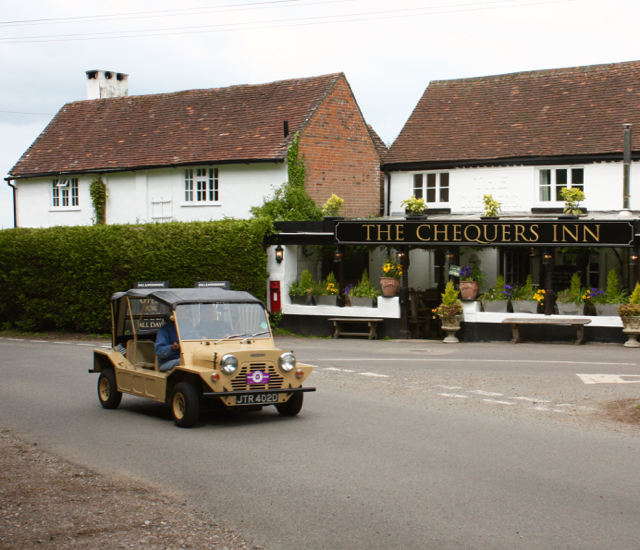 Lots of fun and lots of adventures were to be had including breaking down in the Riley and being looked after by a family in a very remote part of France, apparently it was like a scene from ‘Ello, Ello’ when the poor husband came home to find two english ‘airmen’ in flying hats and goggles sitting in his kitchen! 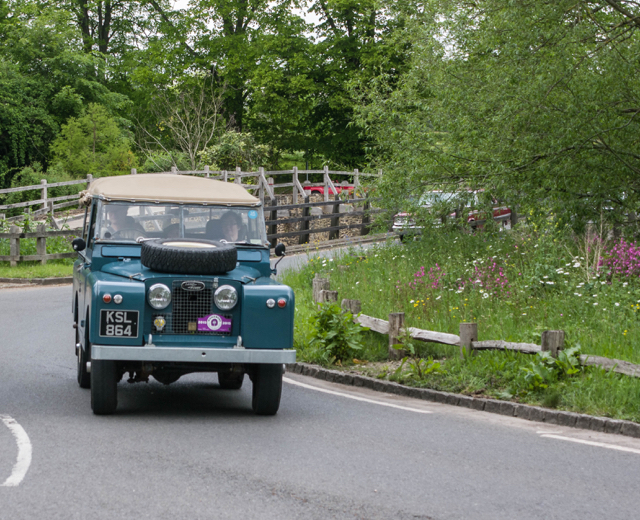 After success driving in the early days, once James started his restoration business he started being asked by clients to navigate for them and so he began a second ‘career’ on the maps, which he now prefers to driving. 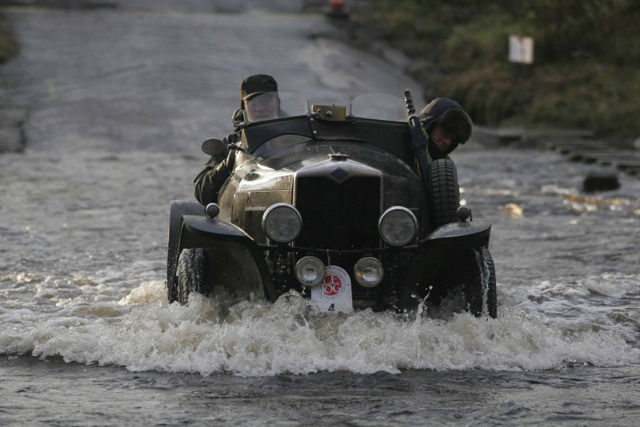 As his interest in vintage cars grew, he started navigating in pre-war open top beasts, generally during the winter, the more inclement the weather the better. 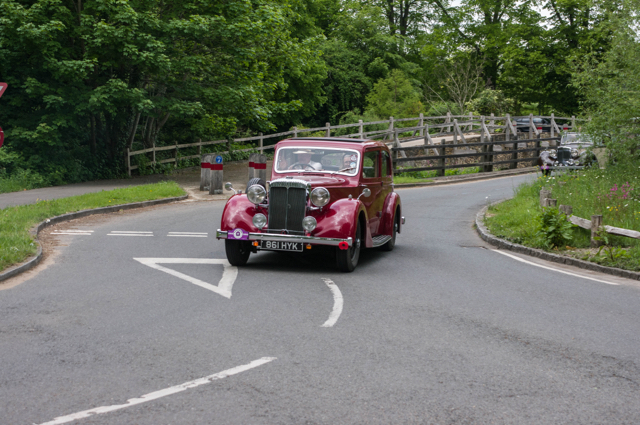 Several Le Jogs were undertaken in various pre-war cars plus several more visits to the North on the Flying Scotsman. 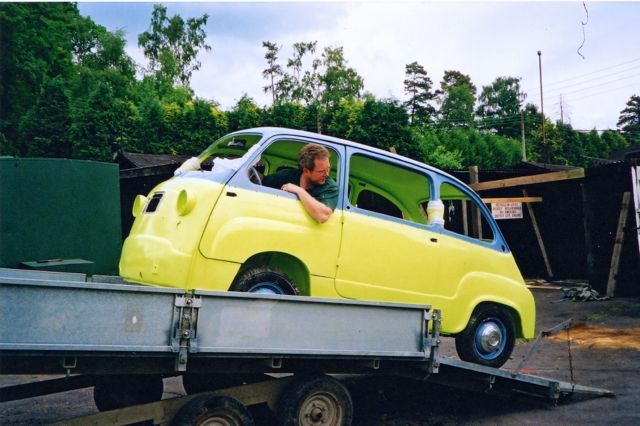 A Fiat 600d Multipla had been on my ‘wish list’ for a while and although we kept a look out on an Italian holiday there weren’t many around and in those days it wasn’t as easy to source vehicles without such extensive use of the internet and ebay as there is today. 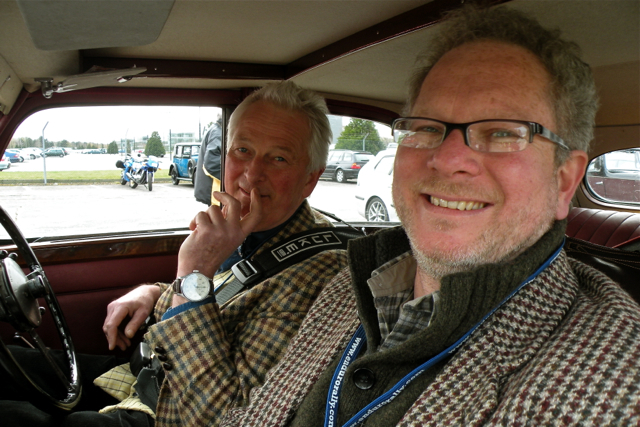 We already had ‘Regie’ a 4cv convertible which I used to drive as a taxi at the Goodwood Revival. 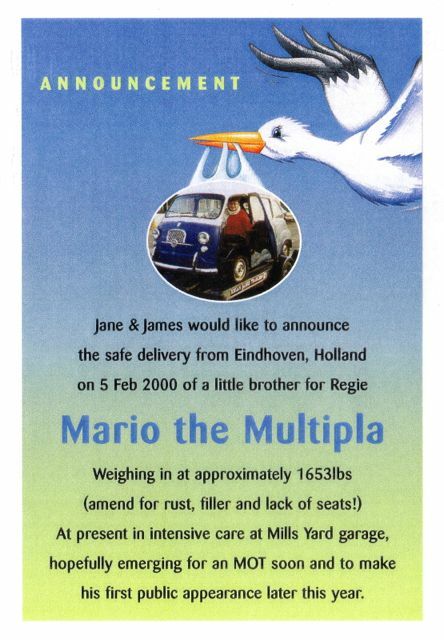 Every year I used to take a Dutch magazine publisher out round the track perimeter, in 1999 he gave me a copy of his latest magazine and I spotted a Fiat Mutipla advertised in the small ads. 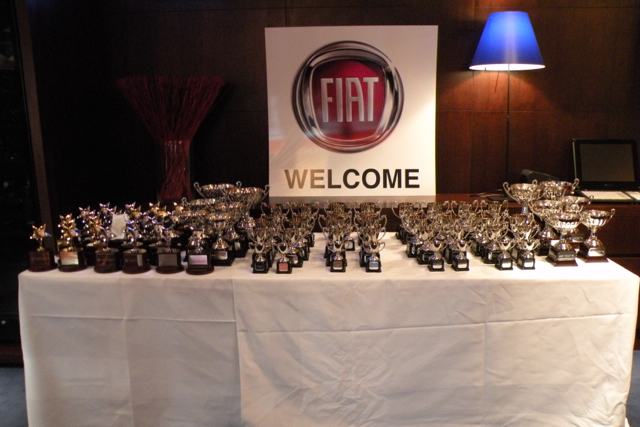 The car was in Holland at a Classic Alfa Romeo dealer, who had acquired the car as part of a ‘job lot’ of Alfa’s. 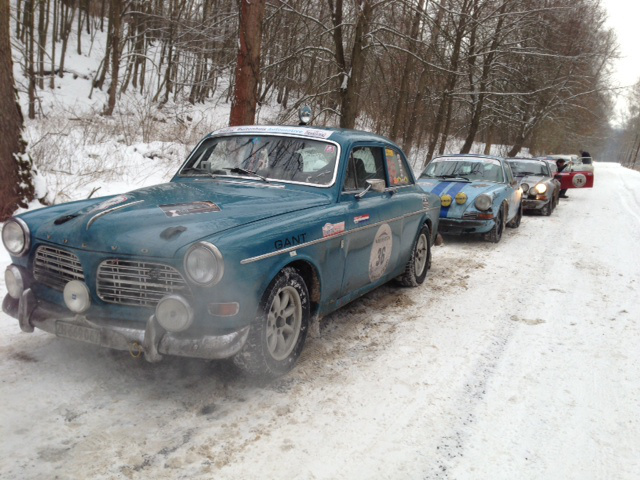 James went on a rally in Northern Europe in January 2000 and on the way back made a detour to ‘kick the tyres’. 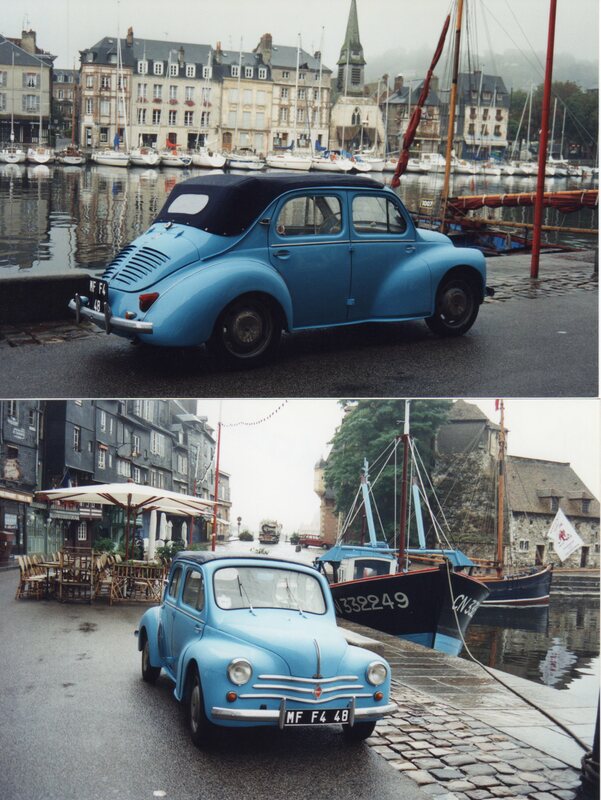 On his return we decided to buy the car and set off on the 5 Feb 2000 with a car and trailer on a ferry day-trip to Eindhoven to buy it. 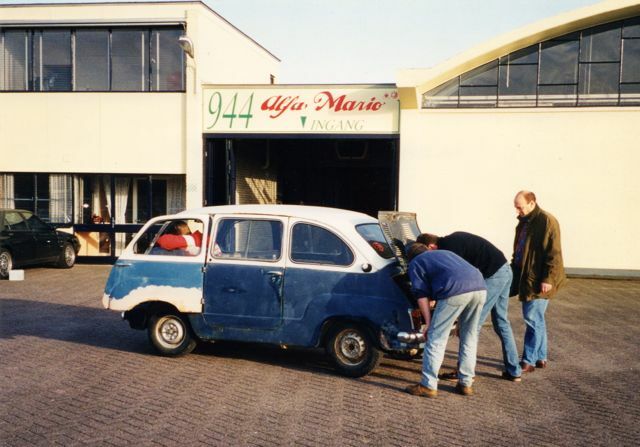 Arriving at ‘Alfa Mario’ I was really excited to see the Multipla for the first time and it was my first opportunity to sit in one. 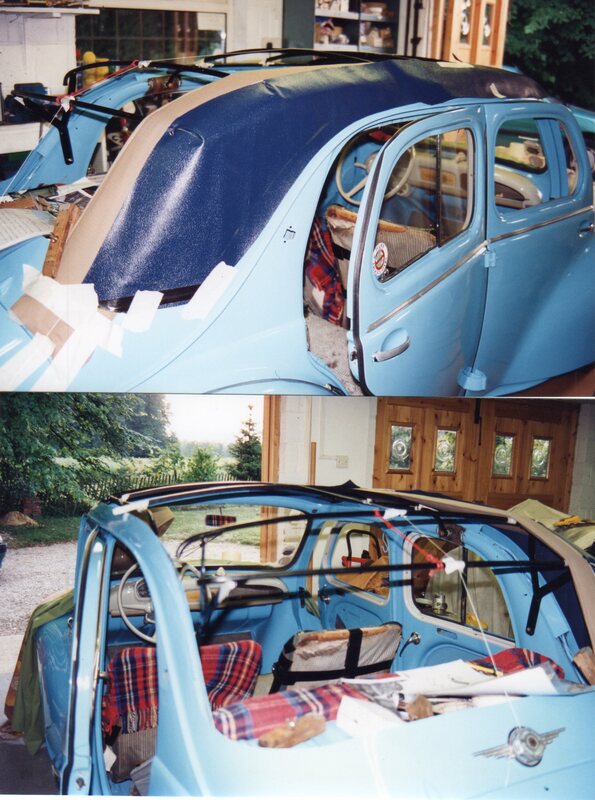 It was a little daunting as the ‘project’ needed a lot of work – there was an awful lot of filler in the doors, half of the seats were missing and the engine was hardly running, however I loved him on first sight and as the car was mostly complete and it wasn’t much money we loaded it on the trailer and set off for home. Mario was an obvious name, we brought him from ‘Alfa Mario’, he was Italian and we discovered it used to belong to a plumber just like Nintendo’s ‘Super Mario’. James was still working for Kodak so this was to be a ‘spare time’ project, although this spurred him on to take up restoration as a career. Mario was installed in the workshop and the mountain started to be climbed. 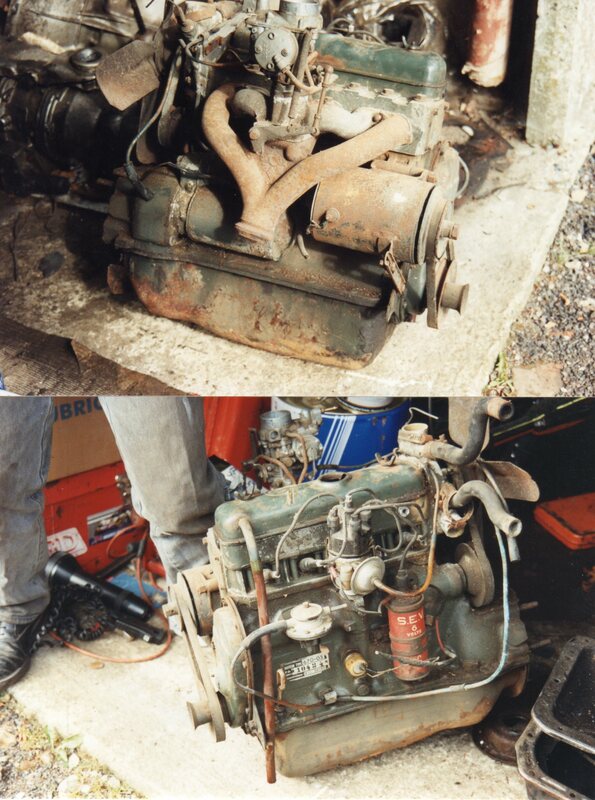 The engine was removed, stripped down and rebuilt, that was the easy bit! 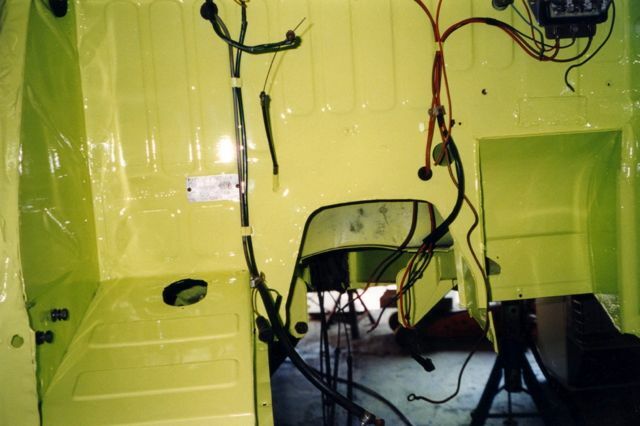 The body was sanded, the rust removed and metal repaired, all the filler removed and the bottom half of the doors fabricated and some structural welding done. 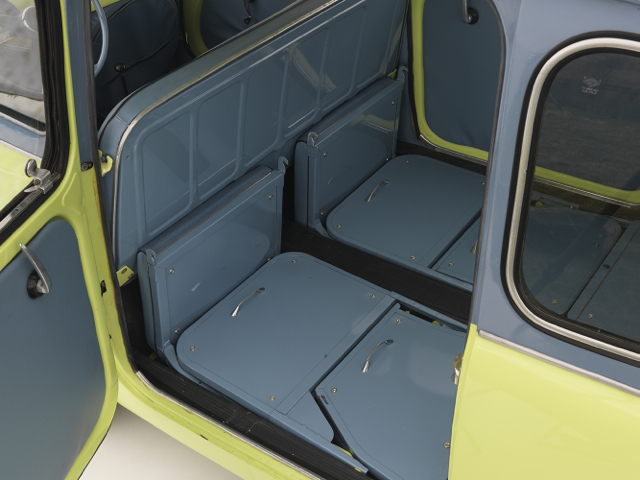 The rear seats were used as a pattern to create a full set. At last it looked like something was happening and the engine was complete the engine bay painted and the engine installed. 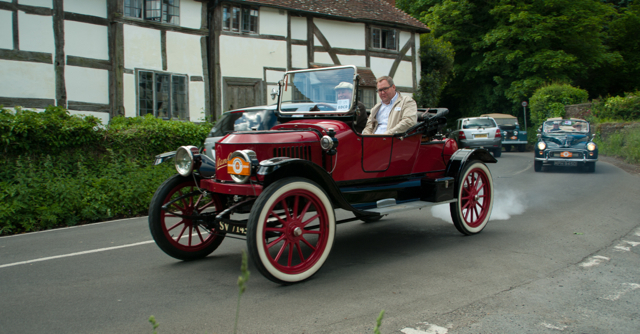 The suspension and brakes were completely overhauled, painted and rebuilt. 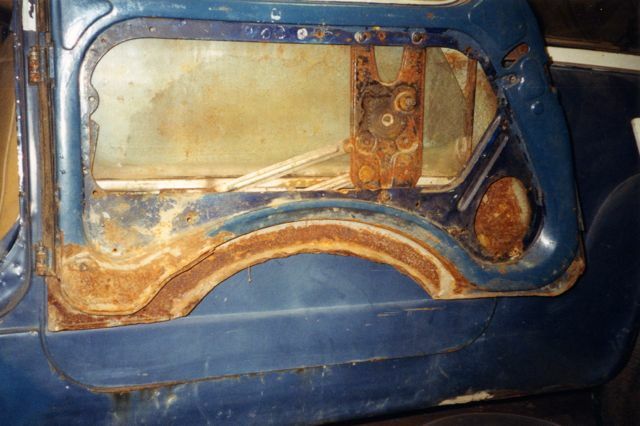 The dashboard was restored and new wiring fitted. 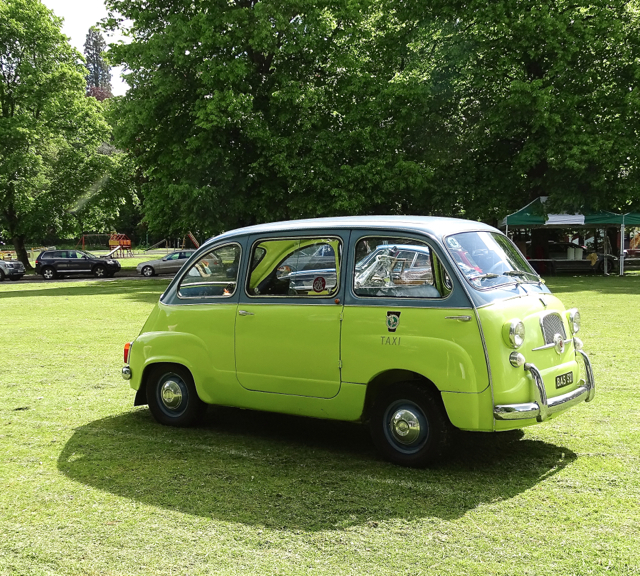 The inside and underneath was painted – we chose the colours by colouring in lots of black and white drawings until we got a combination that we liked, it is not an original Multipla colour scheme but they are Fiat colours from the era and it suits him. Finally the day came when I could drive the semi-assembled Mario around the yard, no glass, lights or doors but an exciting day none the less. 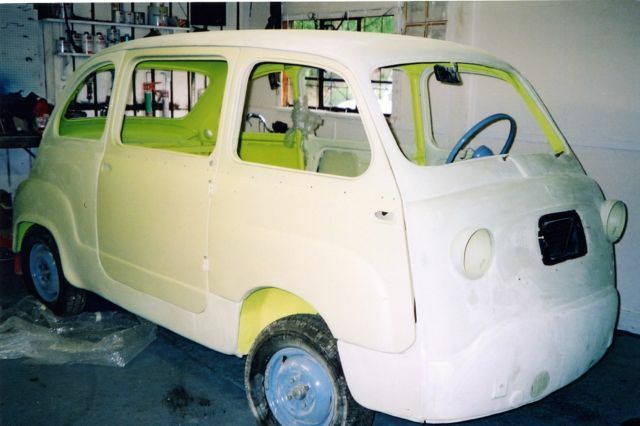 The outer body was prepared and primed and then Mario went off to be painted in the cleaner environment of a friends body shop, he arrived back looking fantastic. 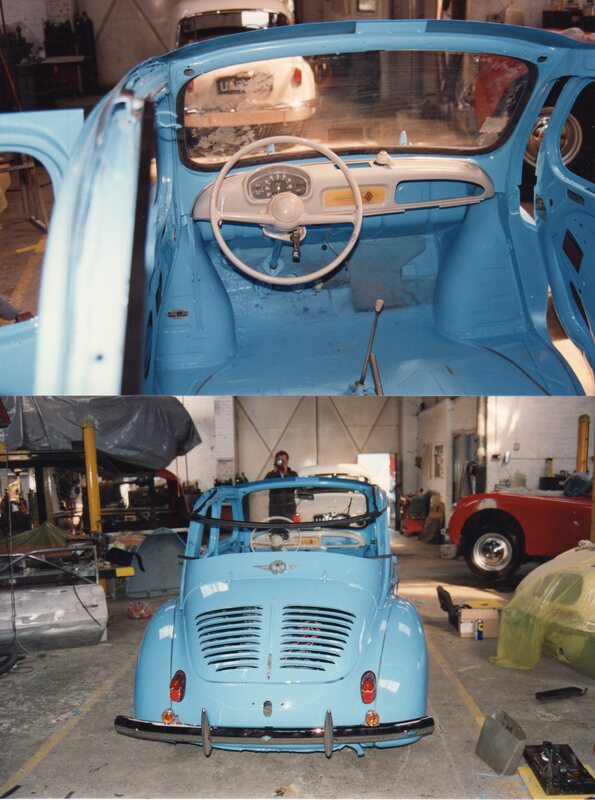 The job was far from over though, all the glass had to be fitted, the old windscreen had cracked when it was removed and we had to source one from Switzerland. 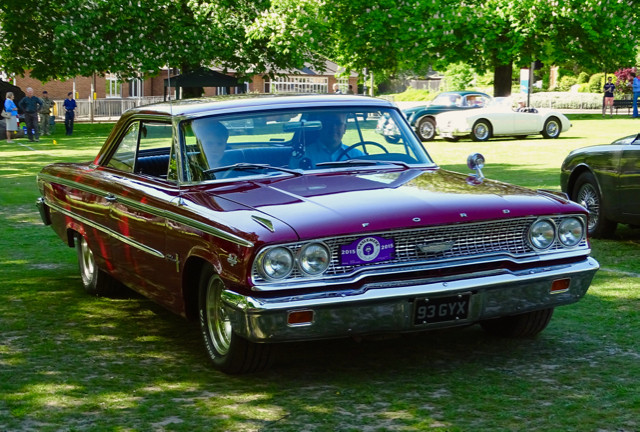 Luckily we had most of the trim pieces and we managed to source the few missing pieces including a reproduction badge from California at great expense. 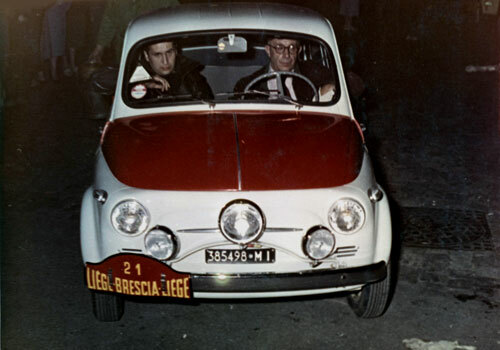 From Italy we sourced door rubbers and a complete reproduction set of rubber floor mats – such a practical car never had carpets. 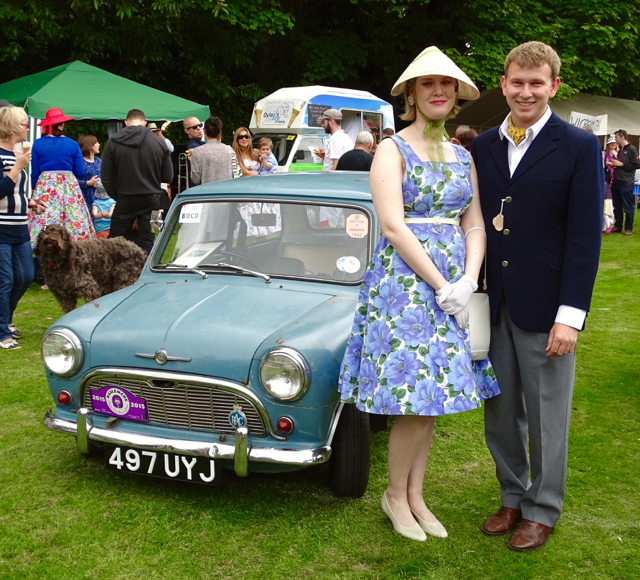 The seats pads were made and trimmed with some period style vinyl and we made and trimmed all the door panels and parcel shelf. 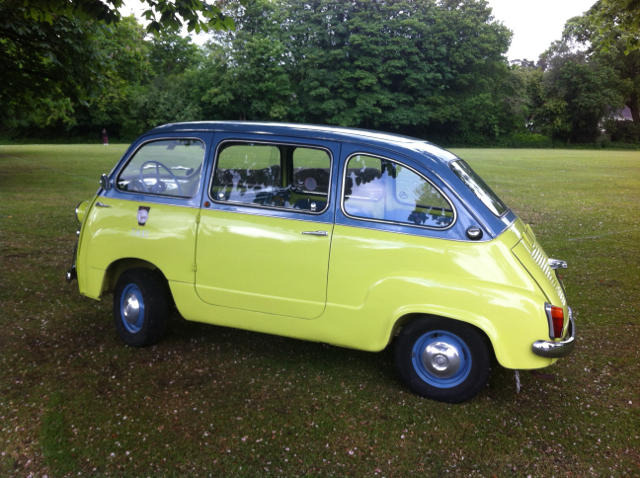 we had a lot of assistance from a Multipla owner in the states who sent us a series of photos and detailed measurements of the seats and fittings so everything could be replicated perfectly. 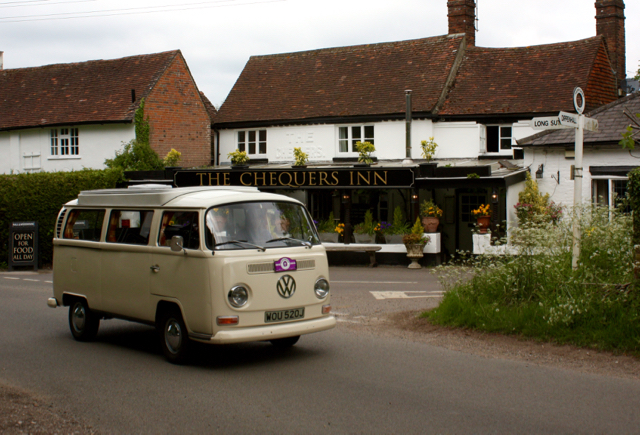 The final touch was a bit of Italian Bulls*** some wonderful checkered trim around the roof. 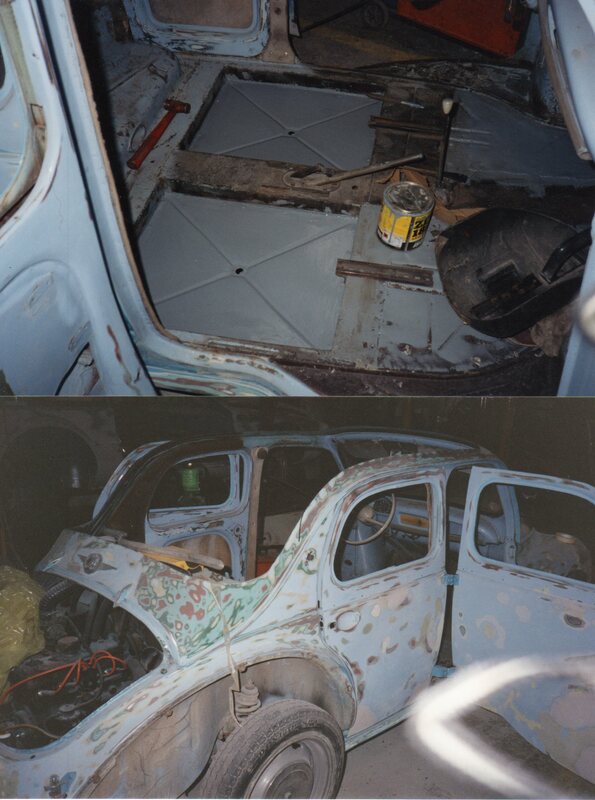 As this work was all being done in our spare time it took about 18 months to compete. In the mean time we had to get Mario registered in the UK. 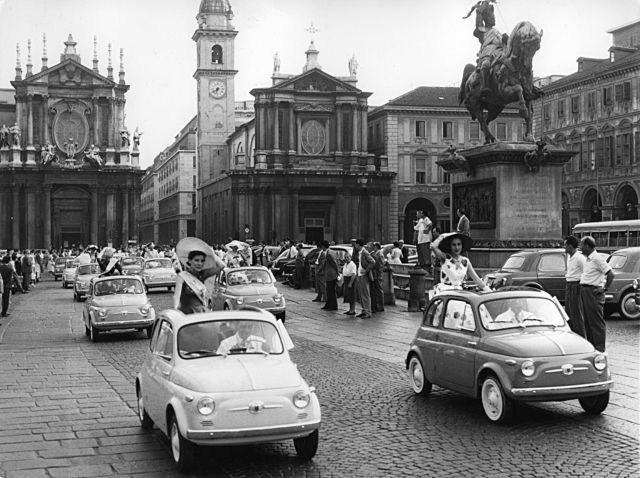 In Italy the paperwork is all returned to the government when a car is sold and so we had very little to go on, not helped by the fact that lots of Fiat’s own records were destroyed in a Turin flood many years before. 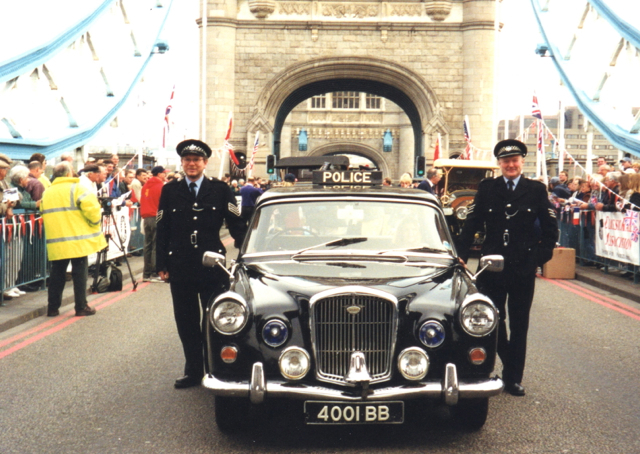 Initial searches gave us a manufacturing date of third week of March 1963, very exciting as I was born on the 23 March 63 so we could share a birth date! 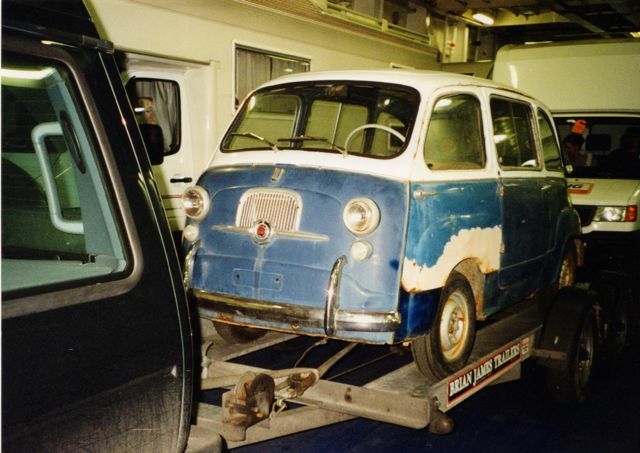 Unfortunately good old DVLA didn’t like this date, they must have had a Multipla with an older chassis number registered before then, then after some correspondence with Alfa Mario with managed to produce some translated documentation and DVLA agreed to register Mario as November 1962 and issued the period number plate BAS 521. Taking Mario on the road for the first time was amazing, we couldn’t believe the attention he attracted and that hasn’t changed 12 years on. 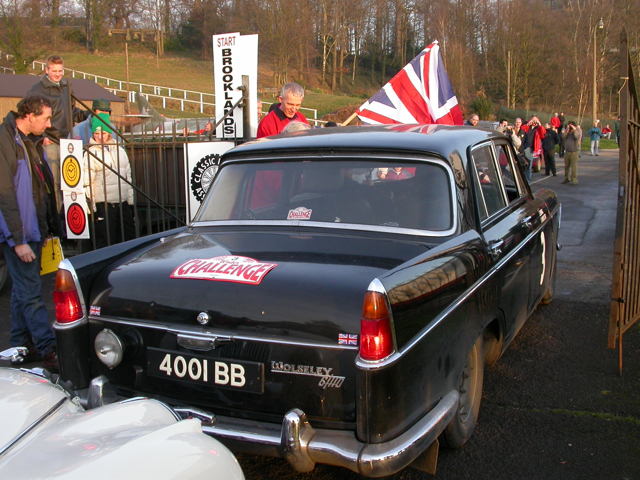 We managed to finish the restoration just in time for the 2001 Goodwood Revival where he was a great hit as press car, especially with Jan the publisher who had given me the original ad, he was delighted that his ‘gift’ had resulted in ‘Mario’s’ creation and to this day he still enjoys a ride around the circuit!